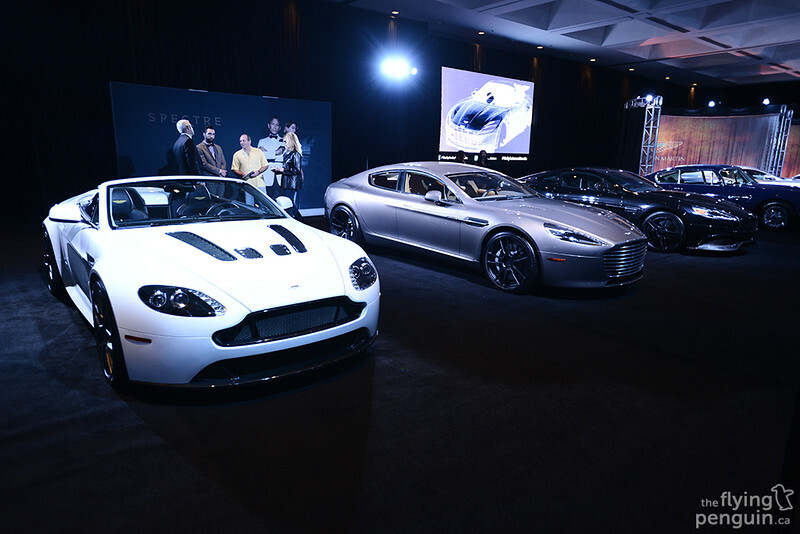 Just when you thought that my automotive coverage was done for the year, I found myself in bright and sunny Los Angeles for the 2015 LA Auto Show. With it being +29°C without a cloud in sight, I figured this would be a much better use of time rather than freezing to death back in good old Canada. 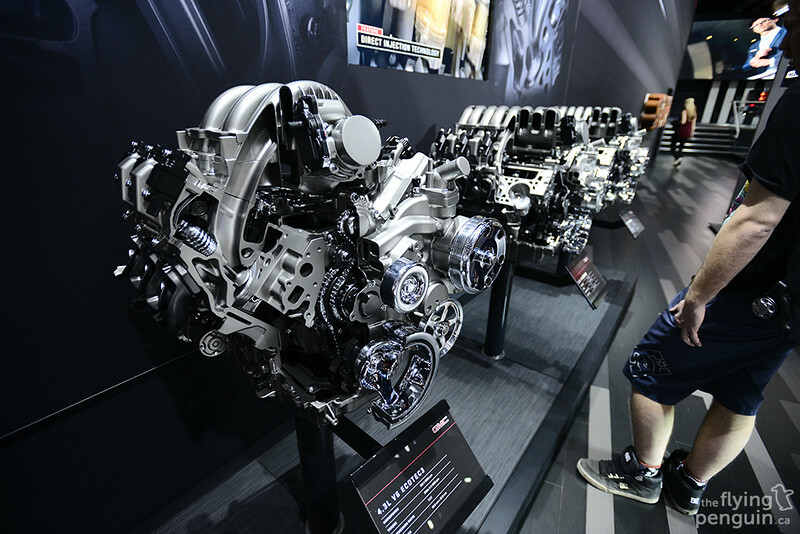 I also don’t get to attend big auto events like this very often so it was quite a refreshing experience for me, especially compared to the events that I attend regularly back home. 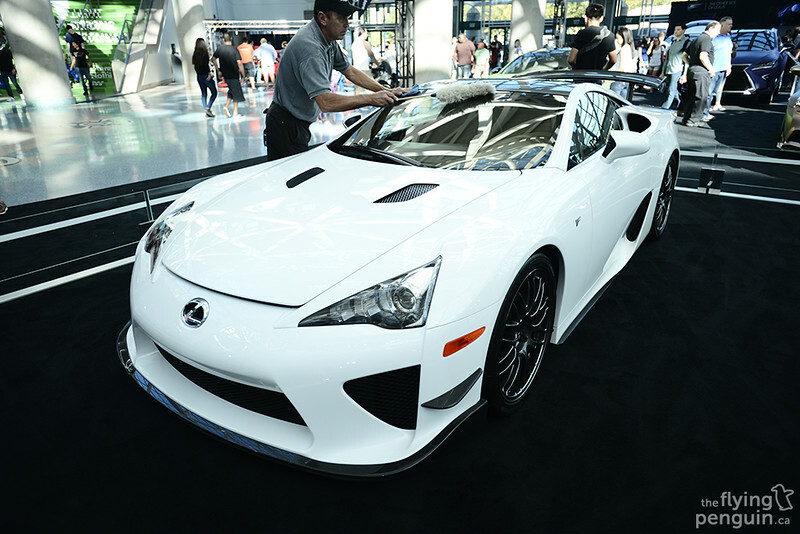 Upon entering the doors of the LA Convention Center, you were immediately greeted with a group of Lexus’ with this LFA Nürburgring being the center of attention. 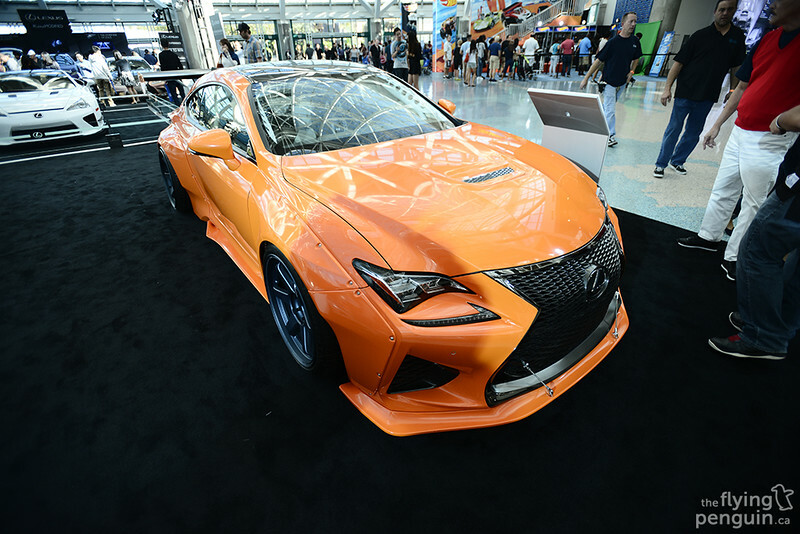 I should also note that SEMA was just a couple weeks prior (which a lot of these vehicles were present at) so it was nice to be able to see some of these cars in person, like this Rocket Bunny kitted RC F built by Lexus-Tuned. 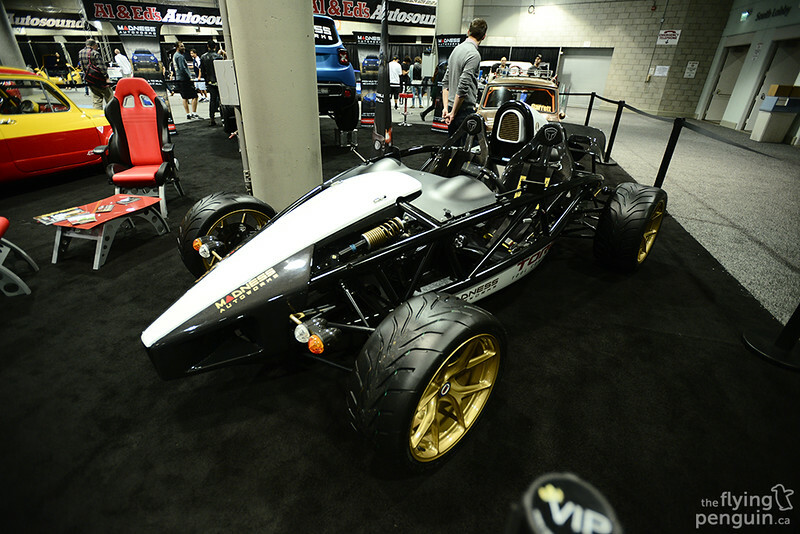 This car was easily one of my favourites from the show. 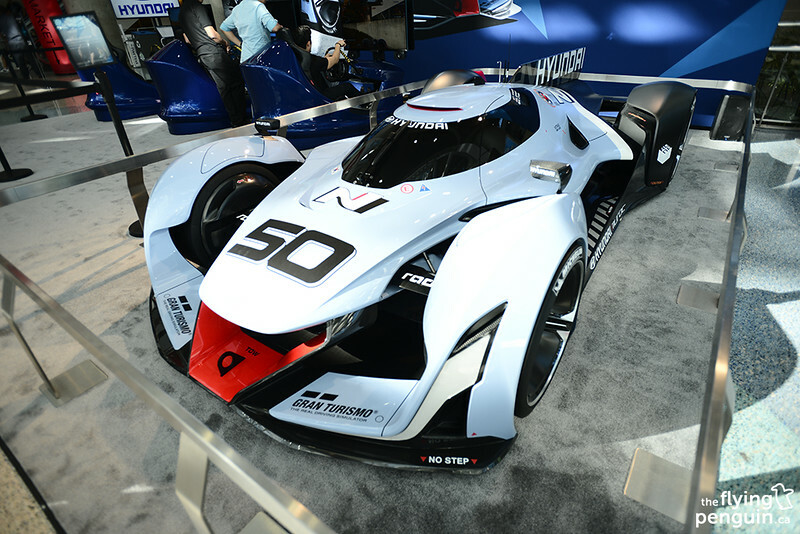 Without a doubt though, my absolute favourite from the show was the Hyundai N Vision – a concept car initially designed for the Vision Gran Turismo series of cars in Gran Turismo 6. 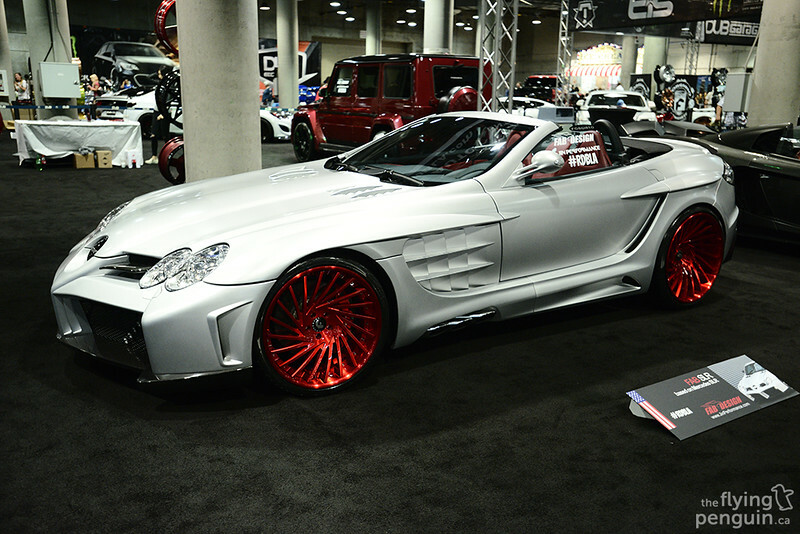 I can’t even begin to describe just how mental this thing looks in person. Basically imagine anything your mind allows you, and then imagine your creation coming to life exactly as you pictured it, if not better. This really left me speechless. 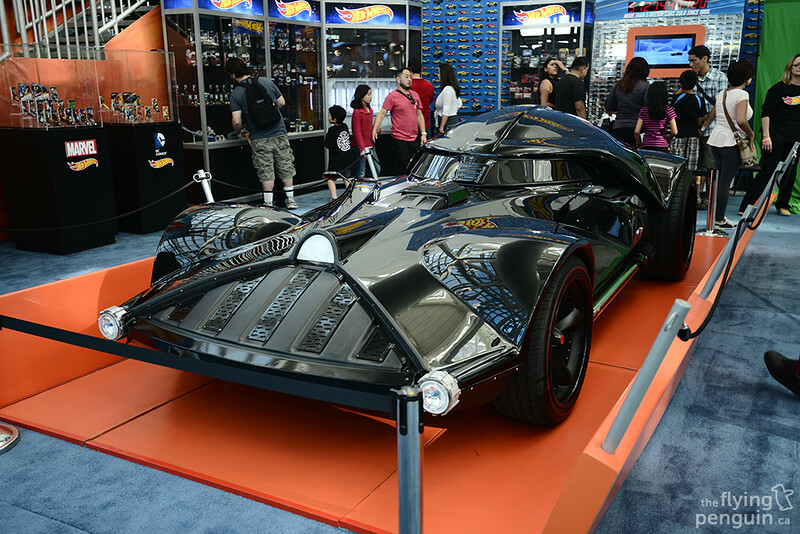 Speaking of imaginary creations, Hot Wheels was on hand with a very large and elaborate Hot Wheels track for kids to play with as well as this Darth Vader-mobile! 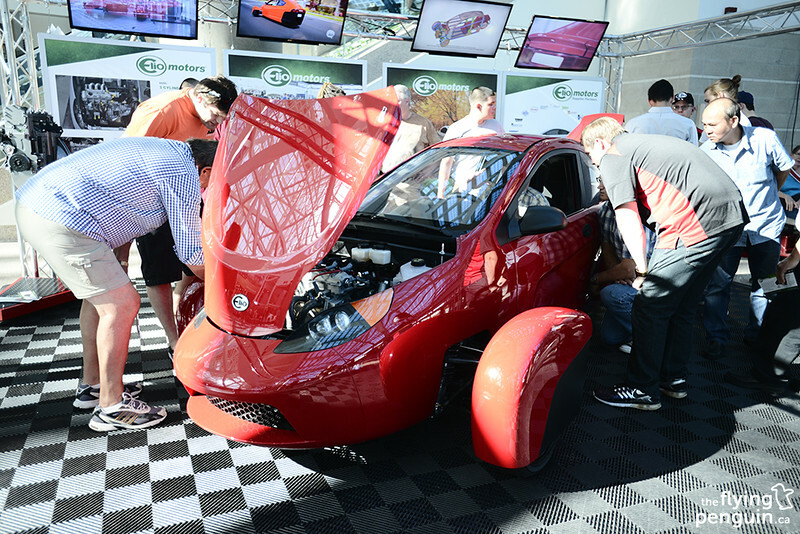 The Elio seemed to attract attention all day with its unique look. 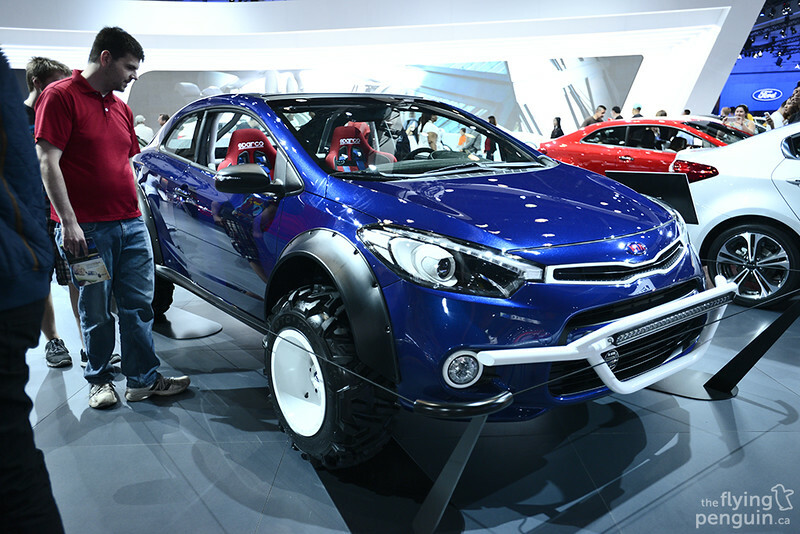 Seats two, gets up to 84MPG (apparently) and starts at just $6,800USD. 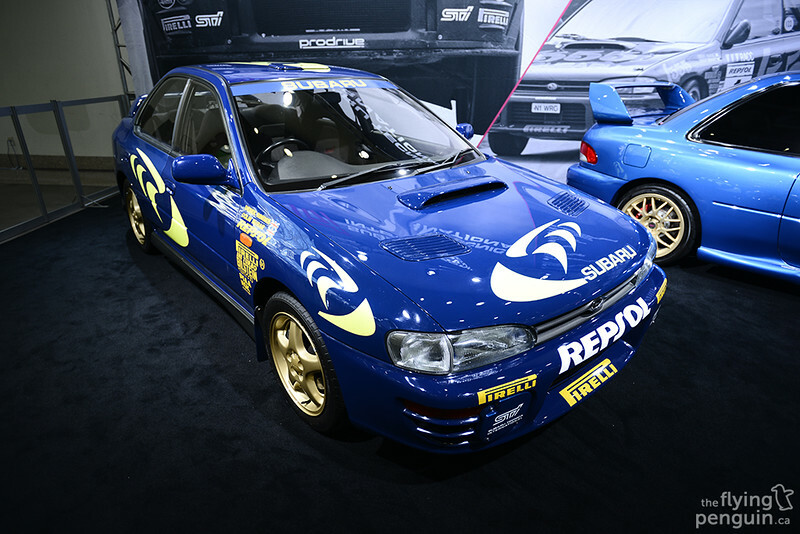 …starting off with this 1996 Impreza 555 Rally Car replica. 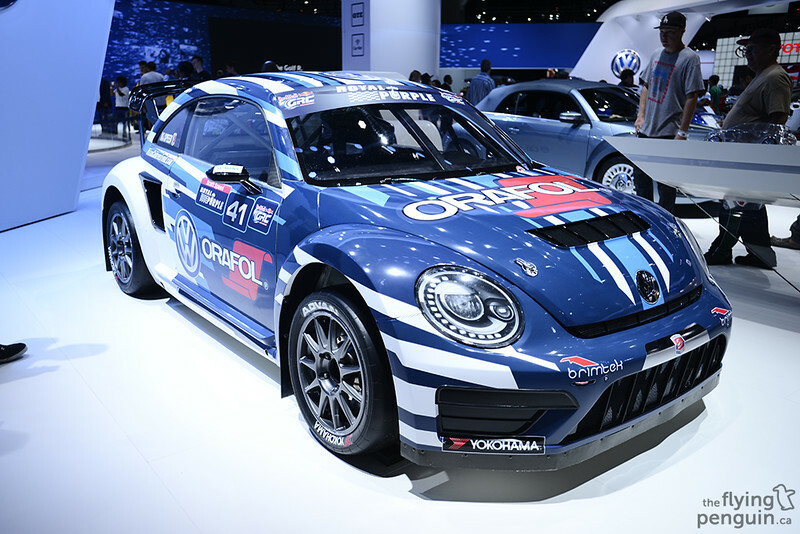 While not a full blown WRC car, it was still pretty cool to see one in such good condition. 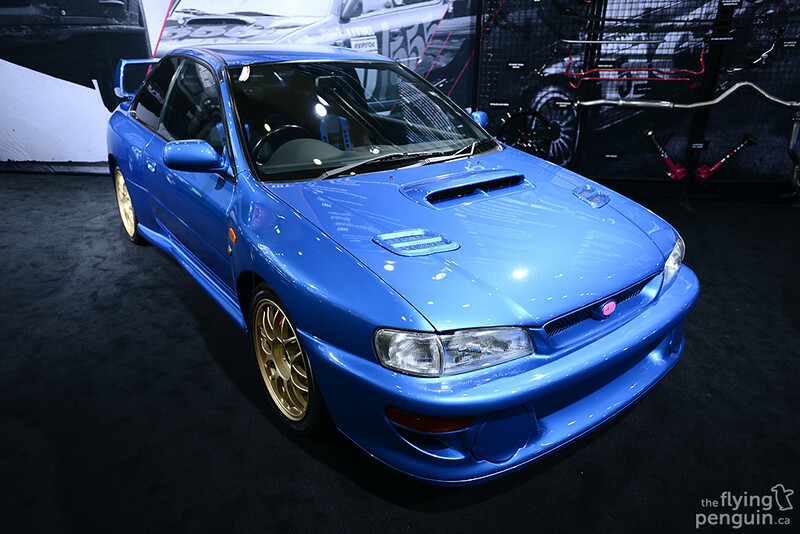 This on the other hand was definitely not a replica; the ultra-legendary Impreza 22B STI. 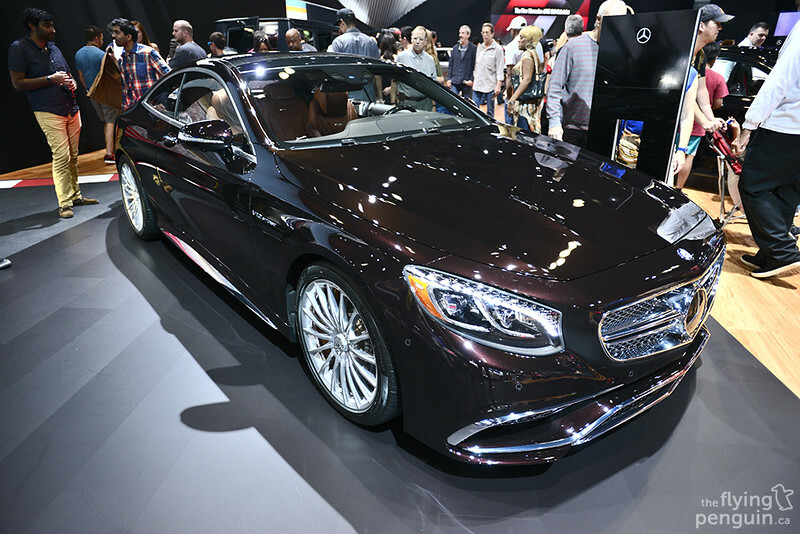 With only 400 units ever produced, this is really more a unicorn than a car. 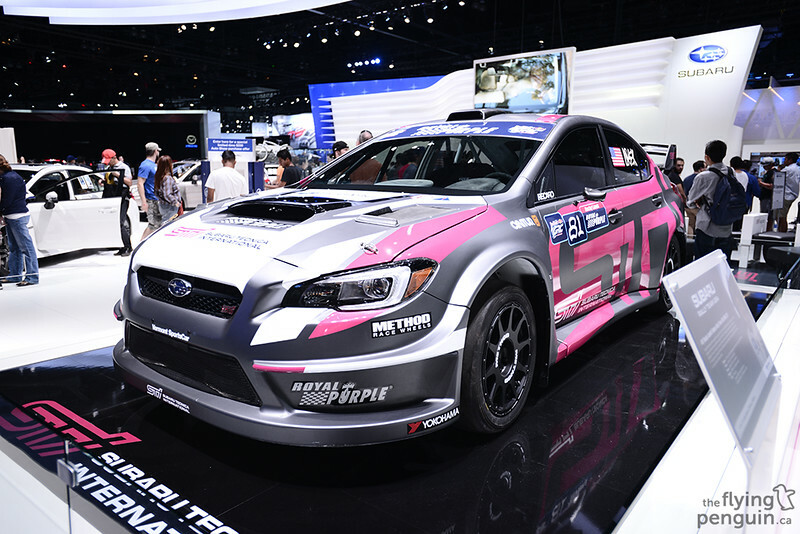 Sitting right next to the unicorn was the WRX STI that Mark Higgins drove to set a new lap record on the Isle Of Man TT Road Course. 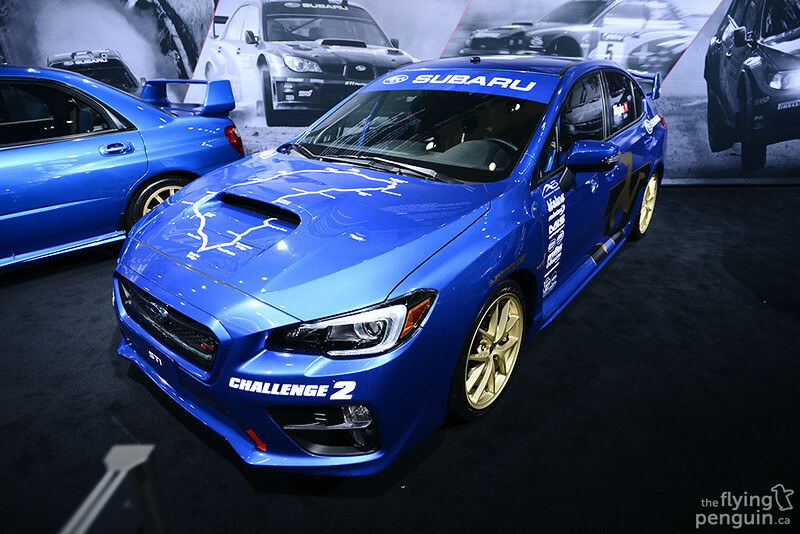 Last but not least in the lineup was the only non-Impreza in the STI booth, the BRZ STI Concept. 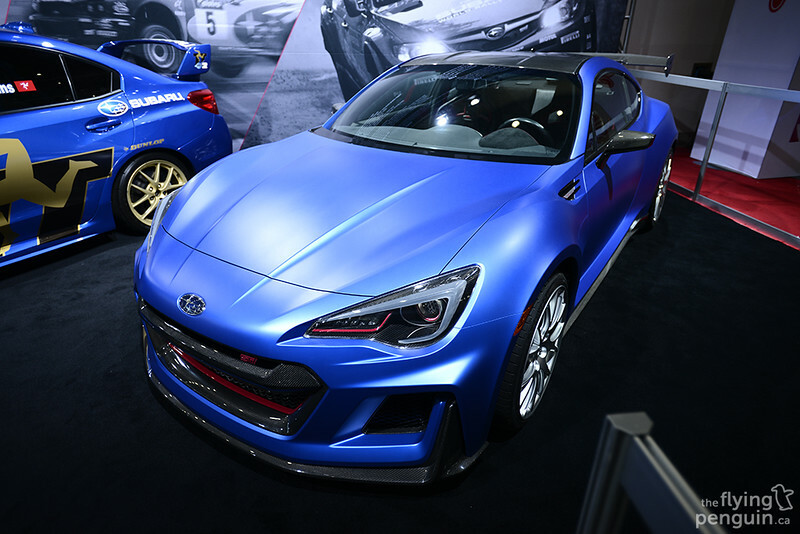 It’s a little weird for me seeing the STI emblem on something other than an Impreza but hopefully aspects of this car finds their way onto the production BRZ. 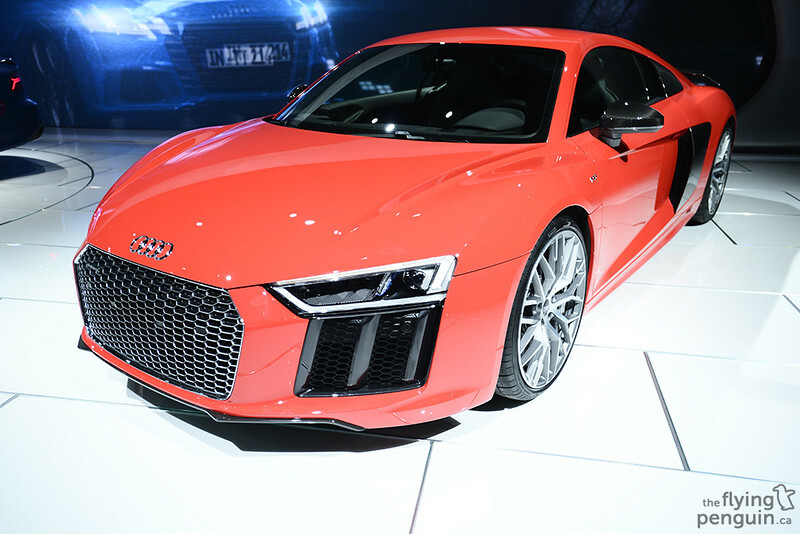 I’m not sure how I feel about the new look of the Audi R8. Almost seems like most brands are going for that “gigantic mouth” look. 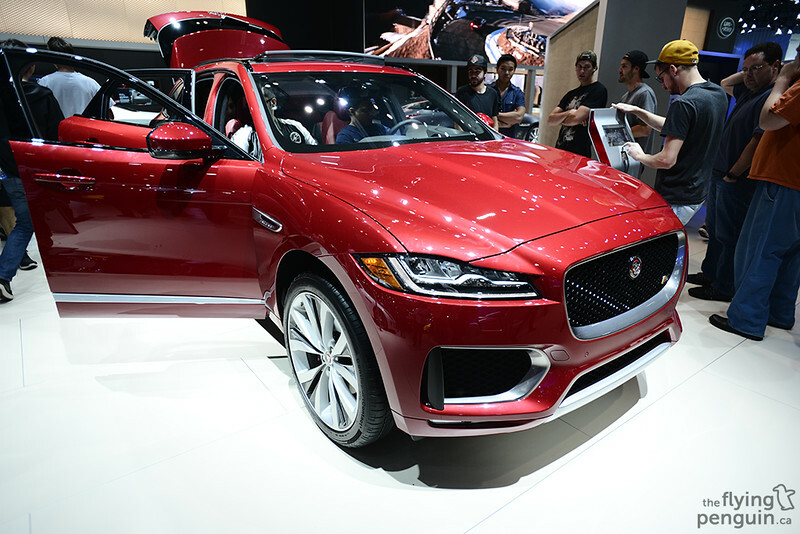 Perhaps I’ve been living under a rock when it comes to new automobiles, but I had absolutely no idea that Jaguar has gone and made a new SUV called the F-Pace. 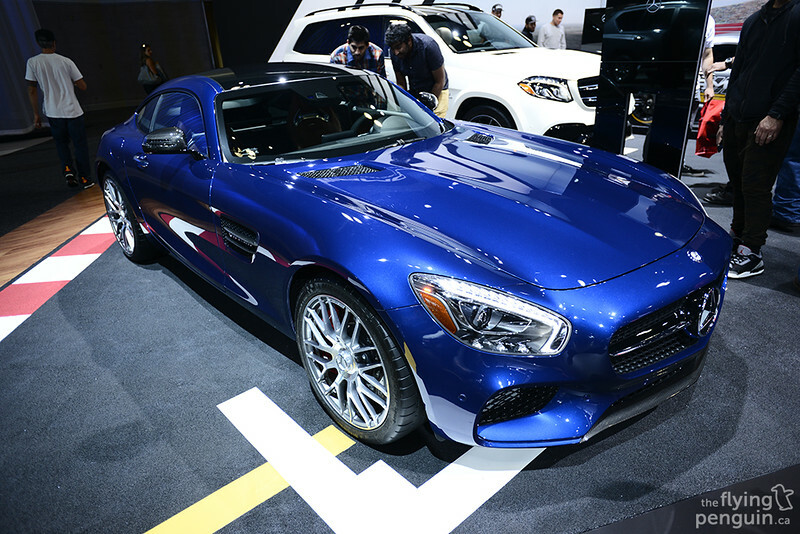 The new AMG GT sitting pretty. 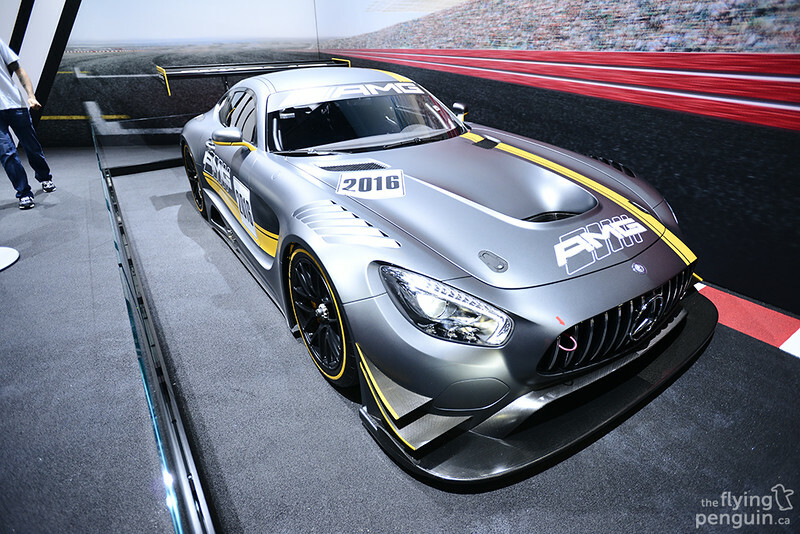 I don’t know why but I still get an “elegant” vibe from this car even when it’s in race form! 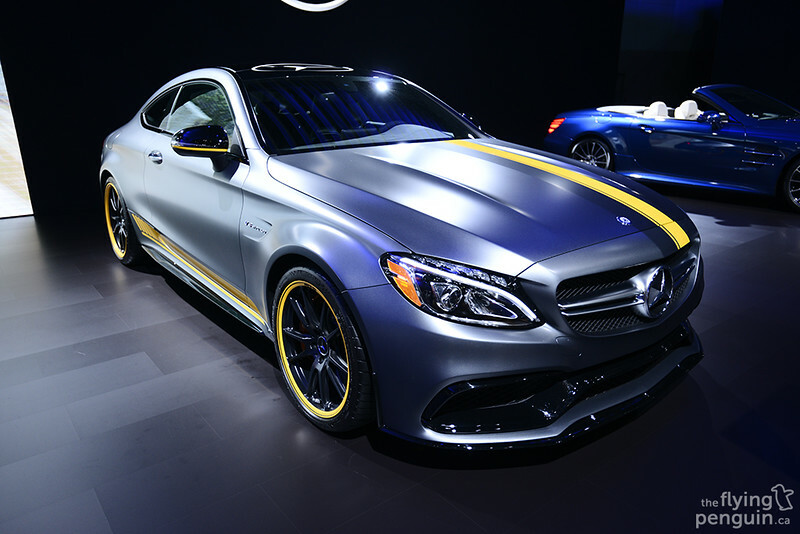 Interesting color scheme on this AMG C63 S Coupe Edition 1 (yes that is its full name). 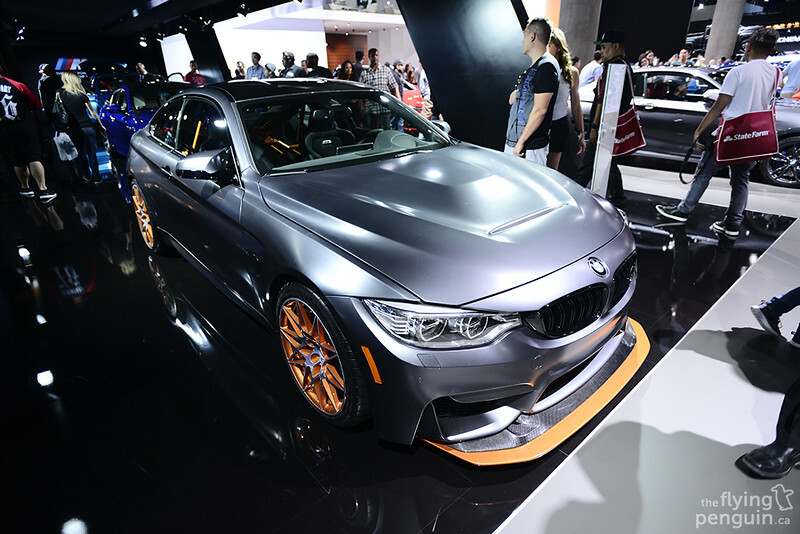 Right next door to Mercedes was their Bavarian neighbors BMW. 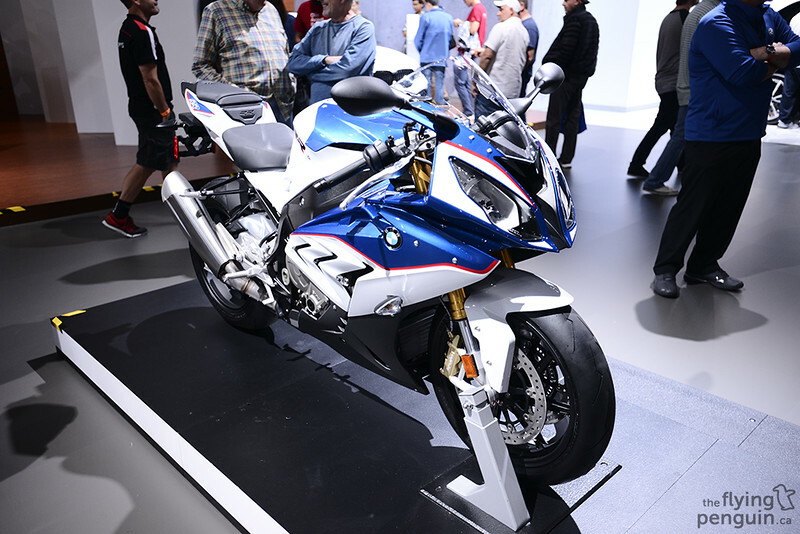 They were perhaps the only manufacture to also bring out a motorcycle that people could sit on! 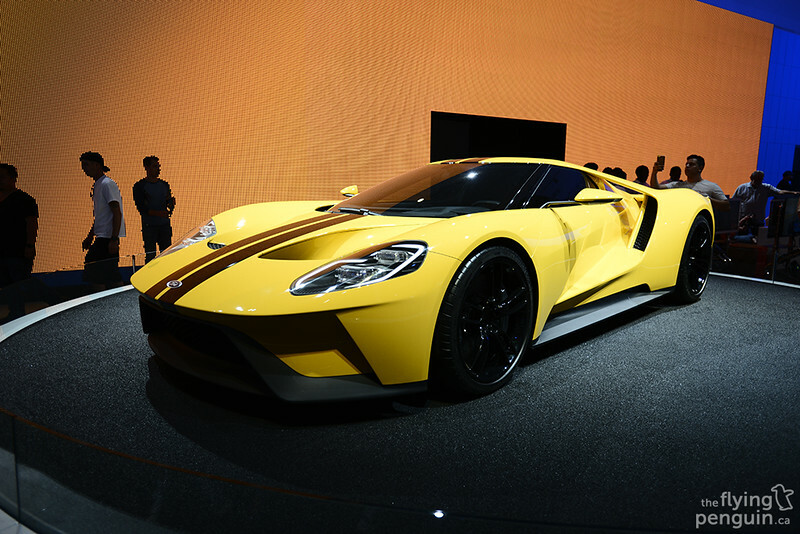 It appears that hybrid may be the way of the future for sports cars, what do you guys think? 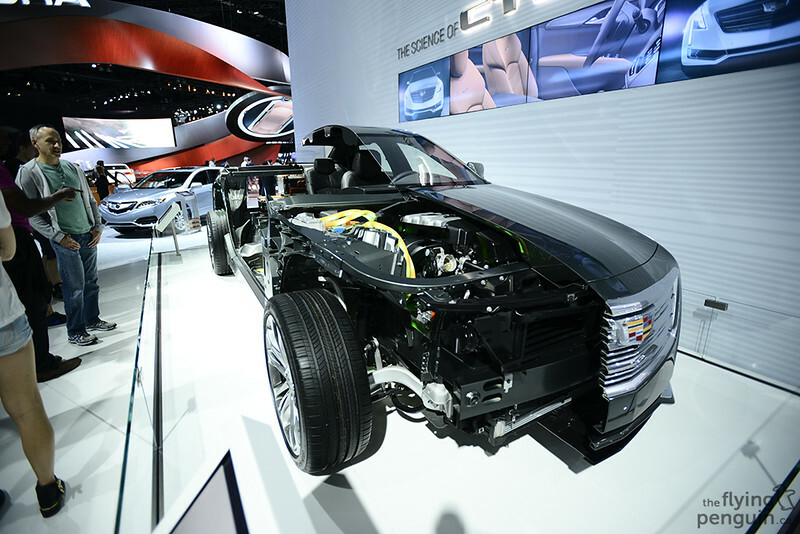 …while others such as Cadillac showed off half-cut cars instead! 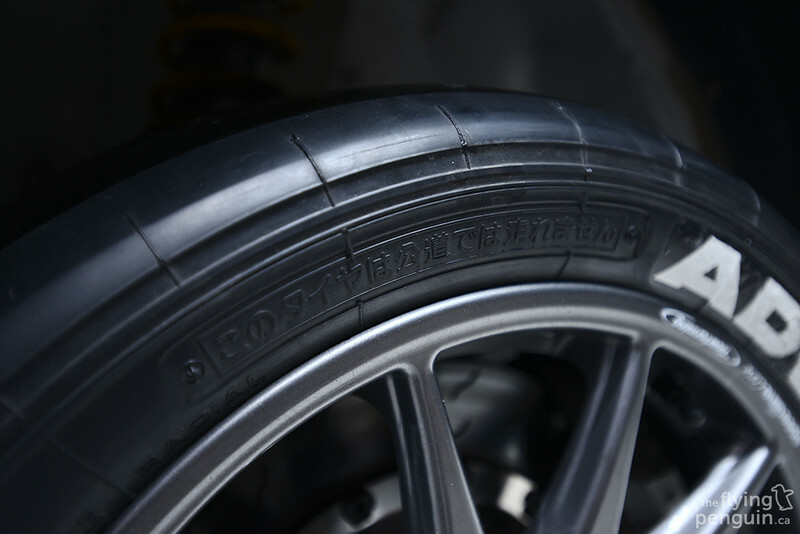 …complete with super JDM Advan slicks! 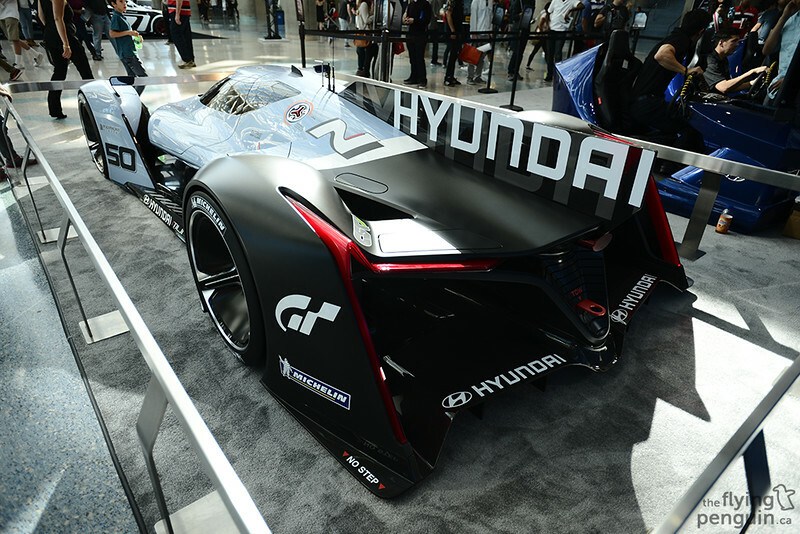 Hyundai wasn’t the only one that brought out one of their Vision cars. 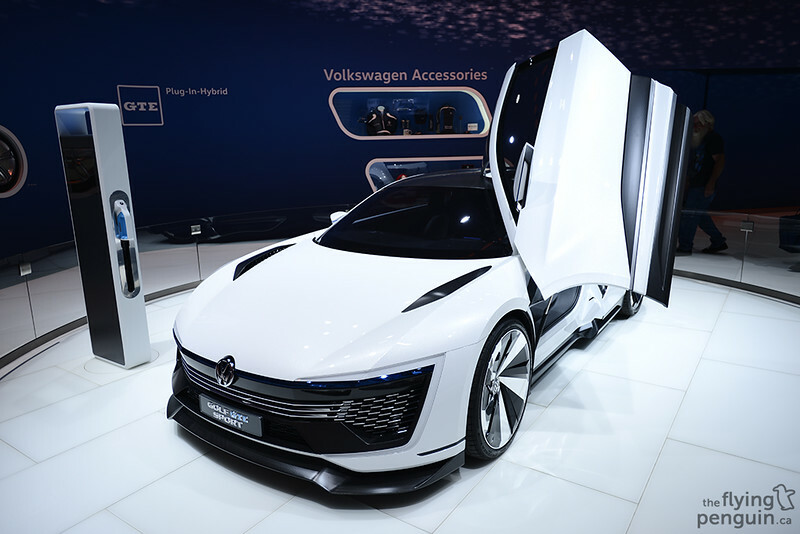 Volkswagen decided to show off their Design Vision GTI Concept which has one of the craziest gauge cluster setups I’ve ever seen. Sadly the car was roped off so I couldn’t get a good picture of the interior for you guys to see. 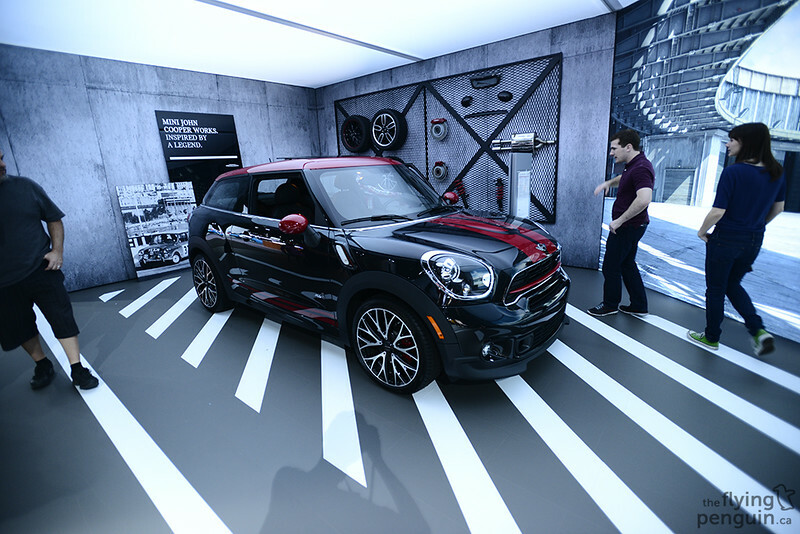 Mini had a very neat garage-style display for people to check out. 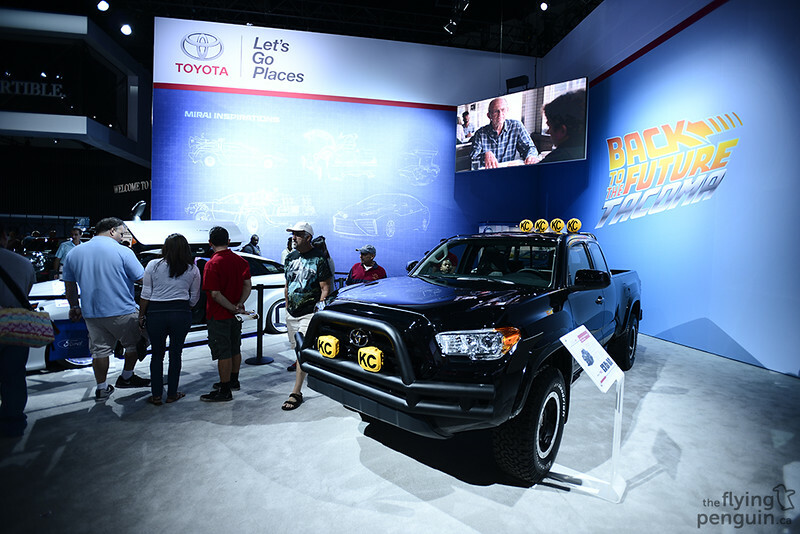 Toyota definitely wasn’t holding back with one of the biggest booths of the entire show. 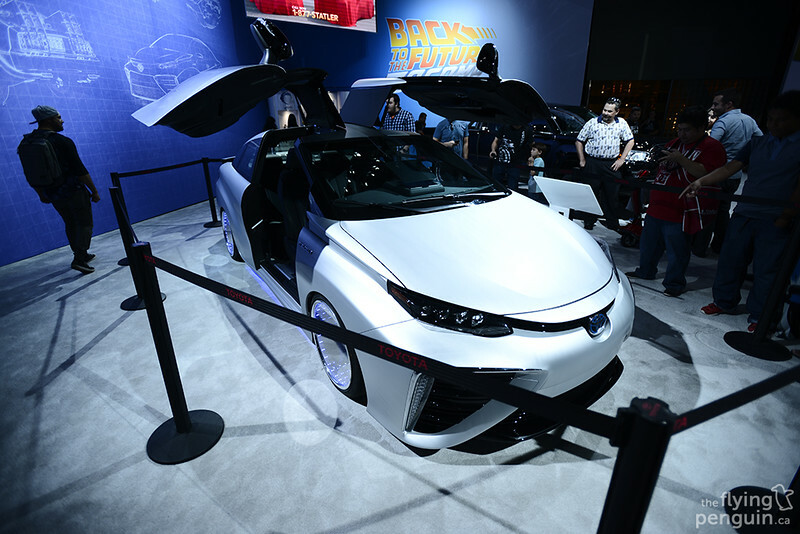 Of course it’s also 2015 which is the year that Marty McFly visited the future so Toyota wanted to celebrate that with the rest of the world. 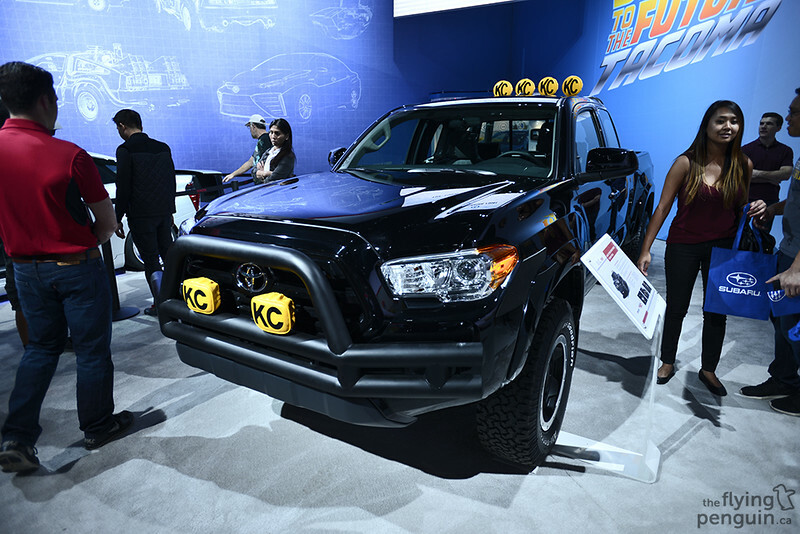 In the movie Marty dreams about one day owning a modified Tacoma, so Toyota decided to take a brand new one dressed up just like the one in the movie. 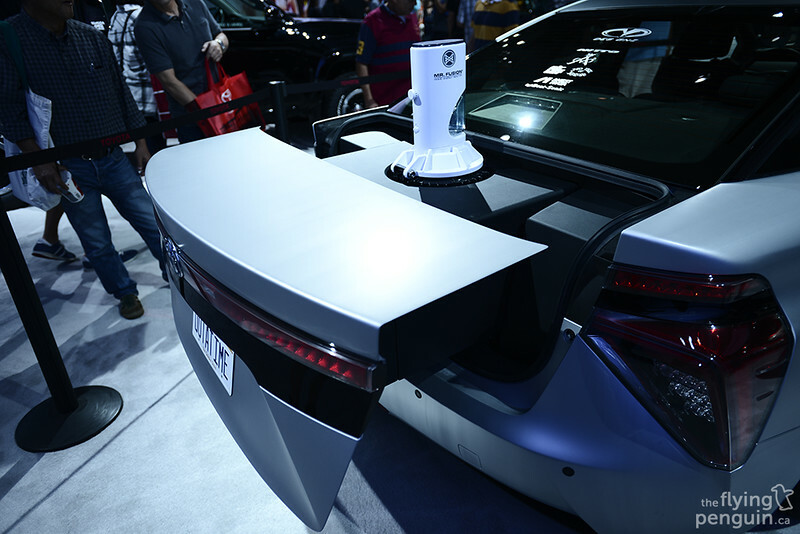 …and even a Mr. Fusion mounted out back! 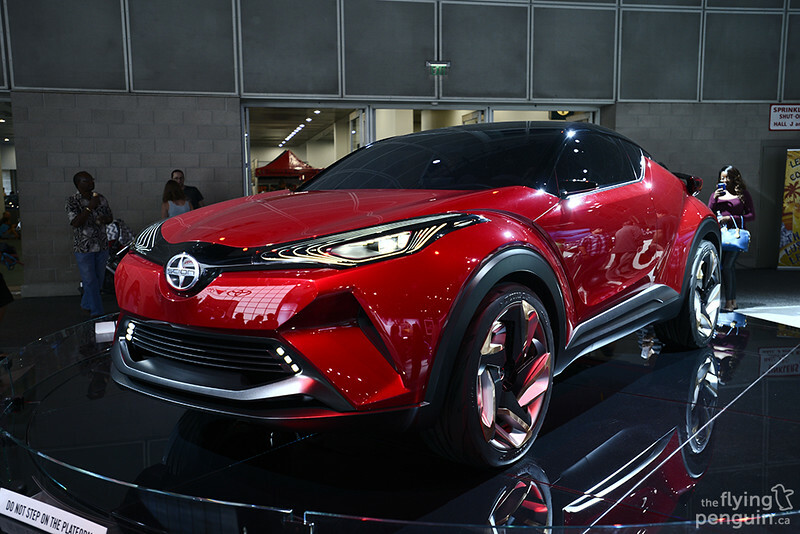 …right down to this Scion C-HR. I’ve been following the two builds of the illest and Crooks & Castles Scion iM’s so I was pretty excited to be able to see them in person. 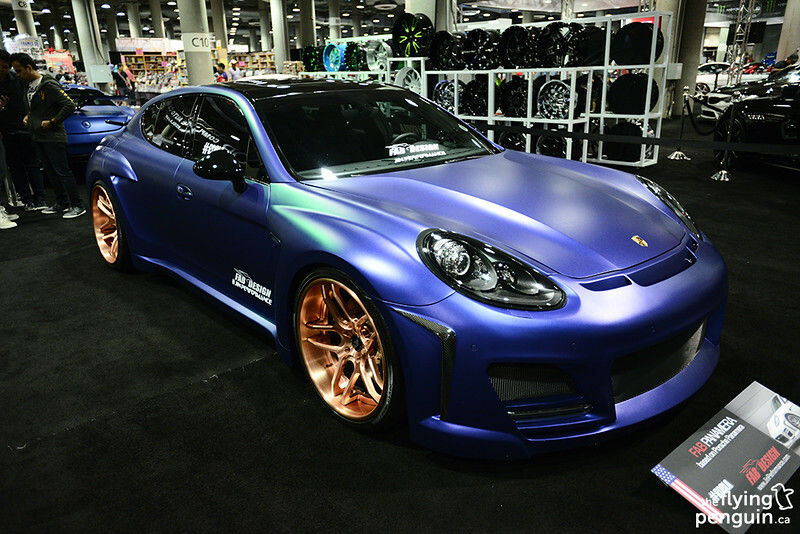 Congrats to Mark Arcenal of Fatlace for winning the Scion Tuner Challenge! 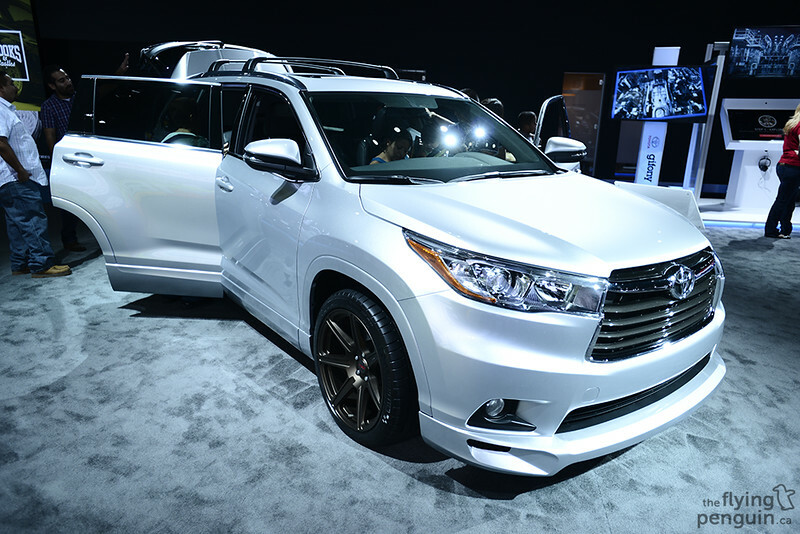 Ok the TRD Highlander is certainly an SUV that I’d rock. 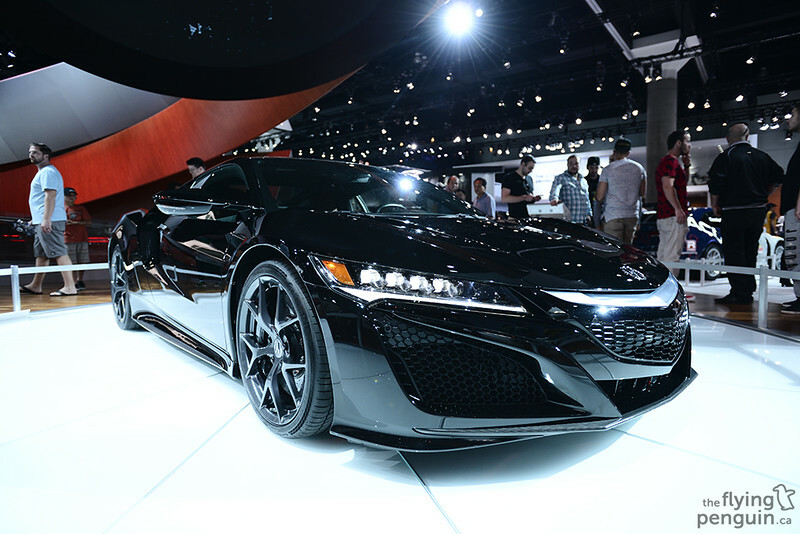 I’ll admit it, the new NSX looks AMAZING in person and I absolutely cannot wait for these to finally be in the hands of consumers! I remember having a massive banner of this car on display at work for a while, now I get to finally see it in the flesh, er, metal! 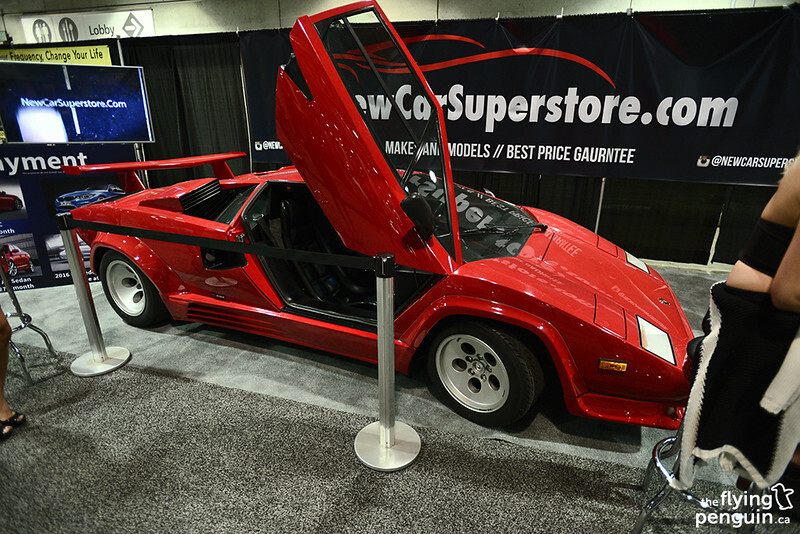 Alfo Romeo’s are a bit of a rarity in Alberta so seeing a whole booth full of them was definitely a treat. It’s always nice to see that the classics haven’t been forgotten. 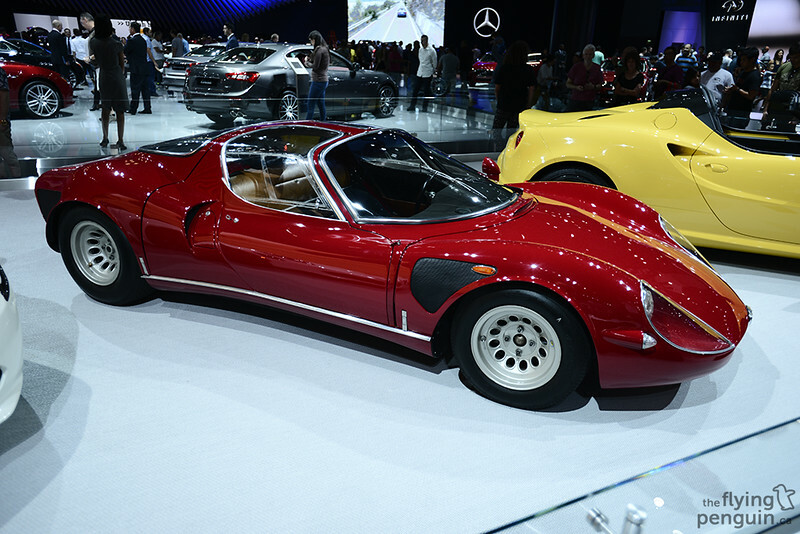 Without a doubt a timeless design! 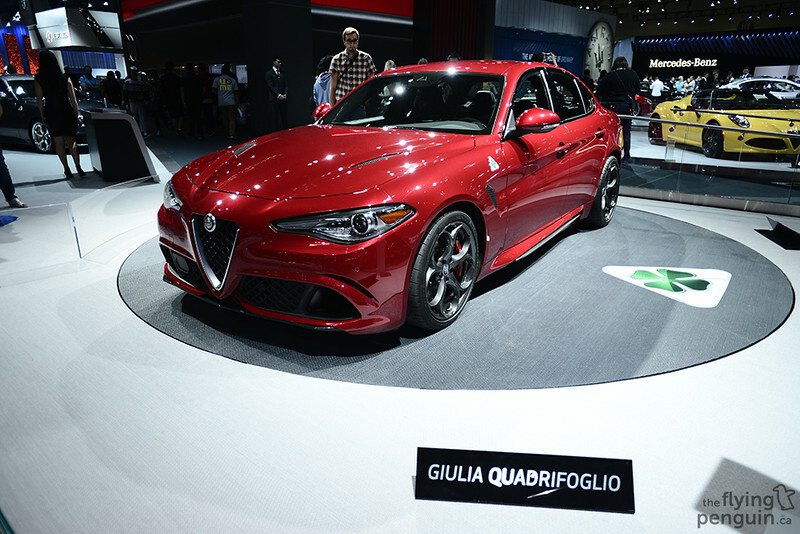 Interestingly enough, I think the Giulia Quadrifoglio’s name actually describes how it looks. 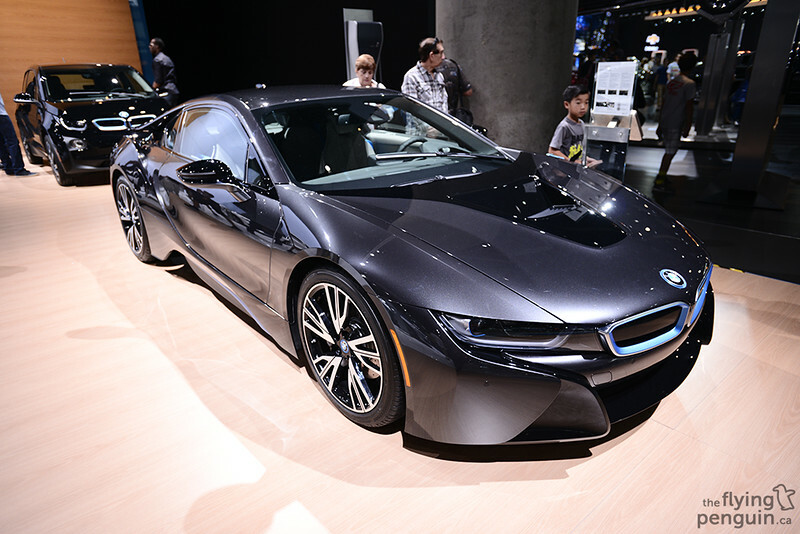 This is still undoubtedly one of the most sinister looking cars out there. 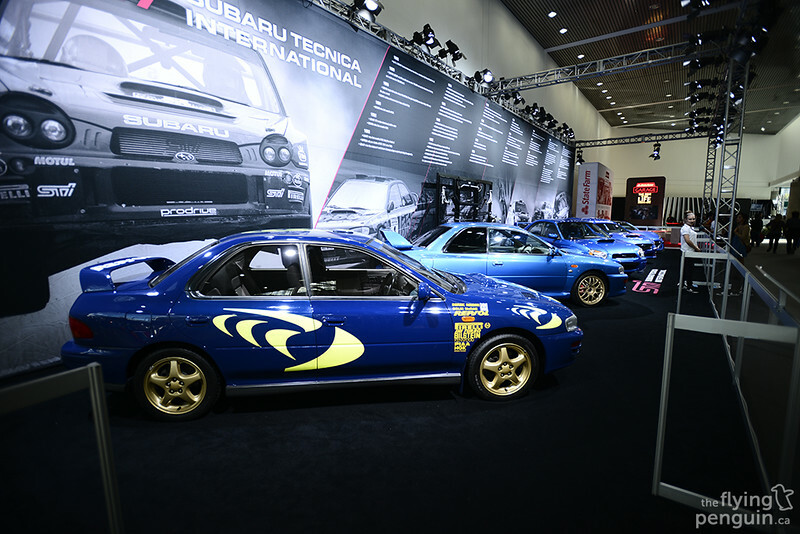 Bucky Lasek’s #81 Rally WRX STI was on display in the Subaru booth. 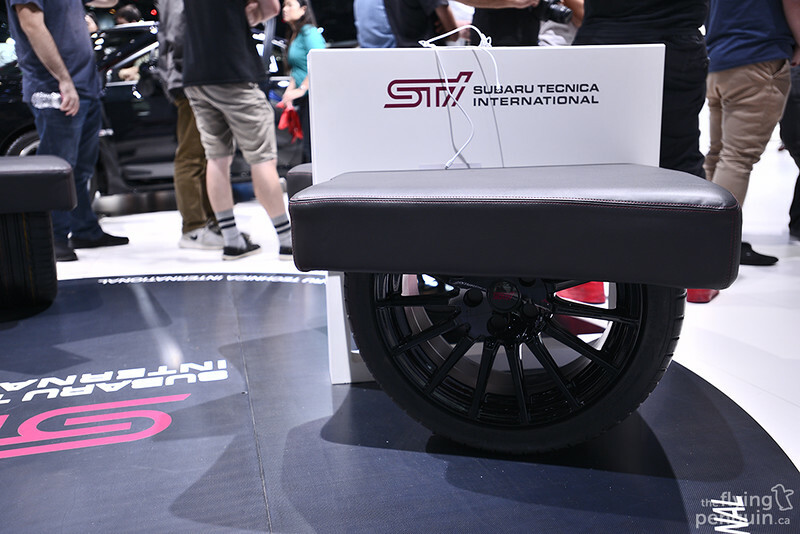 Also in Subaru’s booth were these STI seats for people to take a break on. I wouldn’t mind having these at home! 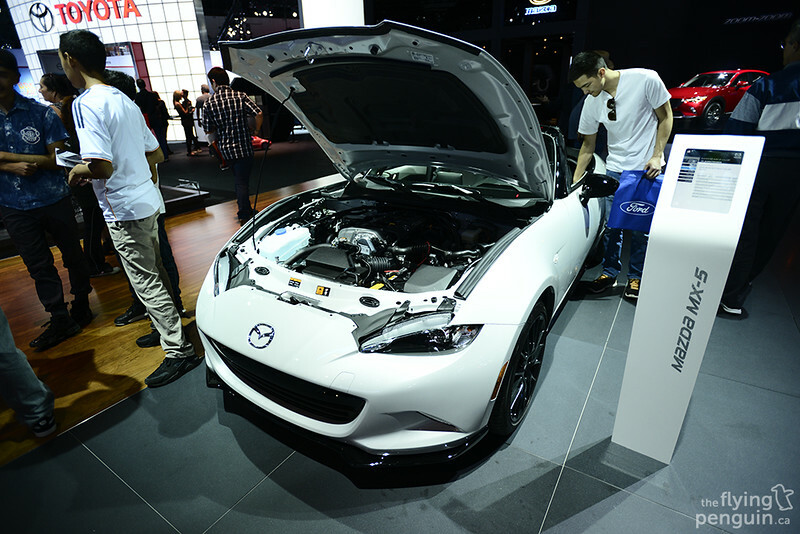 Personally I think that the new MX-5 Miata looks much sharper than its predecessors. 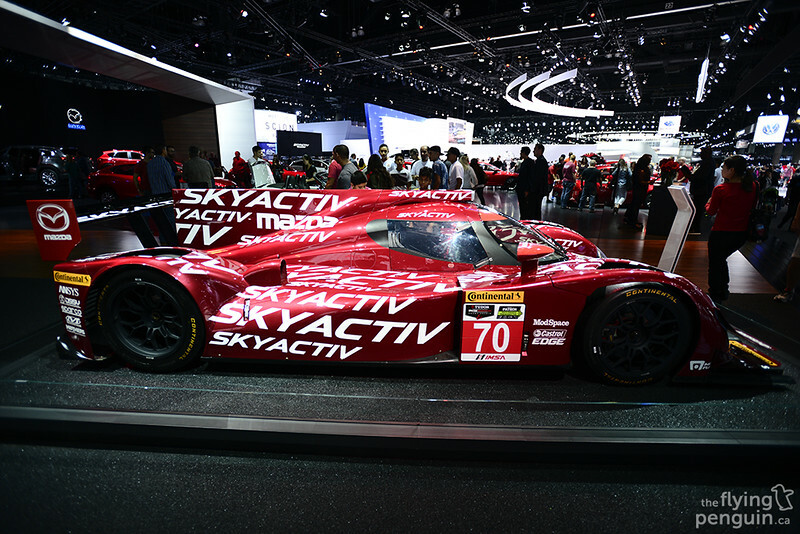 Maybe Mazda can finally shake-off the “hairdresser” image that this car’s always been associated with. 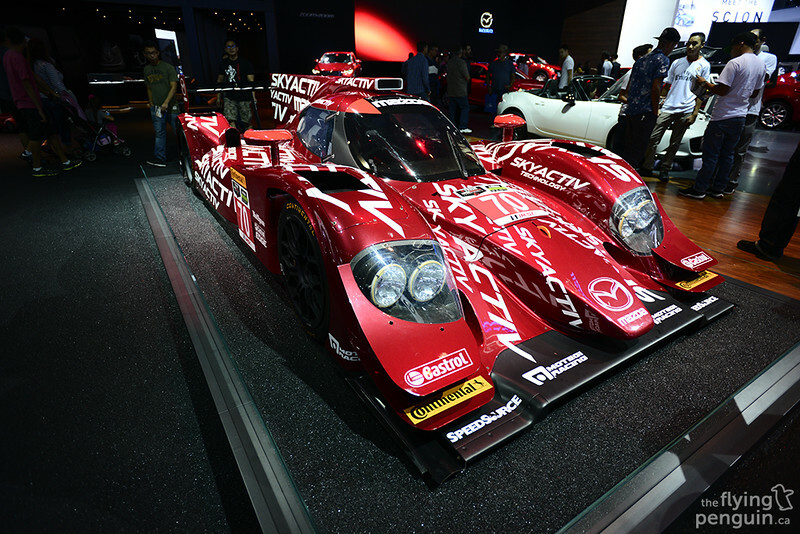 A side view to get a better look at the Skyactiv LMP2’s massive fin. 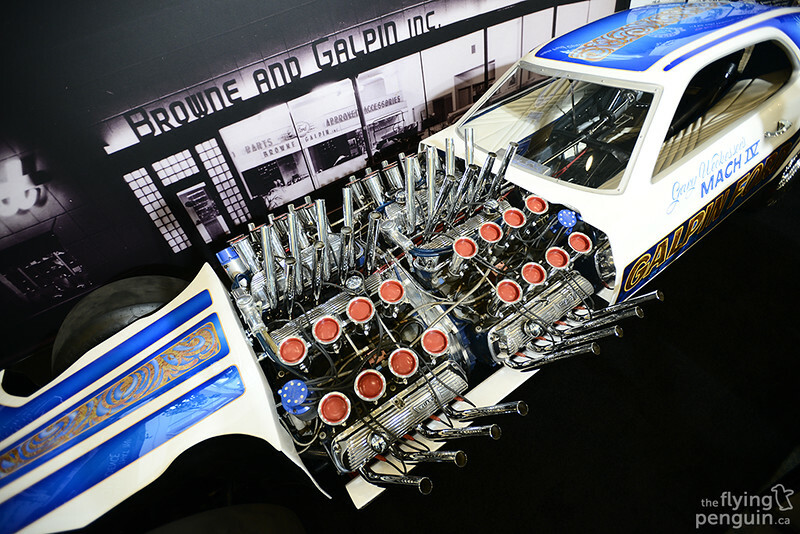 Gary Weckesser’s MACH IV 4 Engine (yes, FOUR engines) Mustang drag car with horsepower figures said to be just north of 3,000. Absolutely mental. 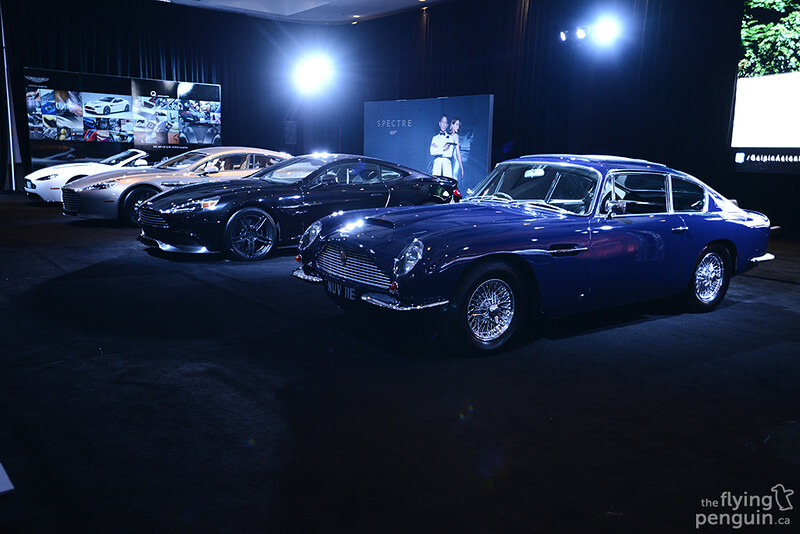 When it comes to class, no one does it better than Aston Martin. 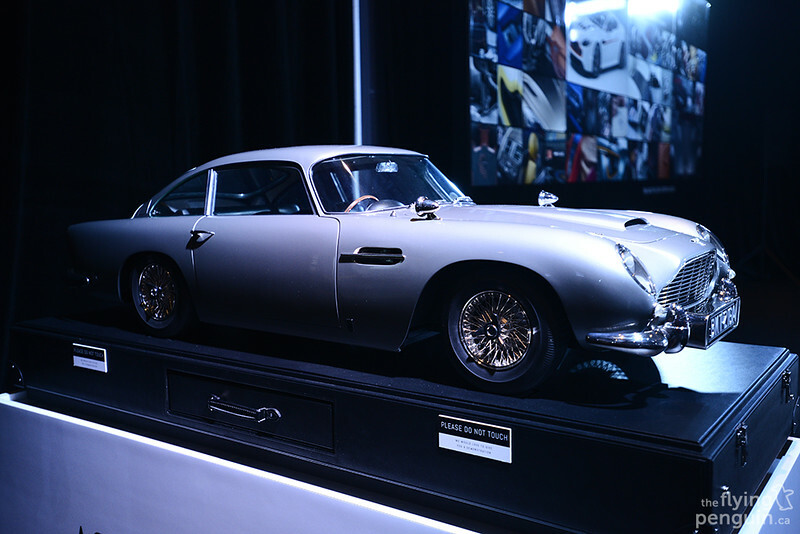 As if the cars weren’t beautiful enough, the booth itself had such a “James Bond” vibe to it, and for good reason. 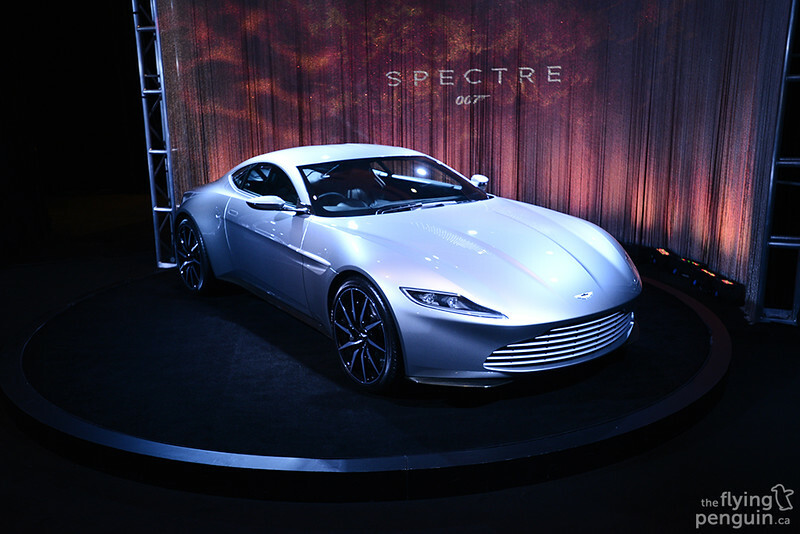 …they also had on hand the brand new DB10 that was specifically built for the new Bond film that everyone was lusting over. 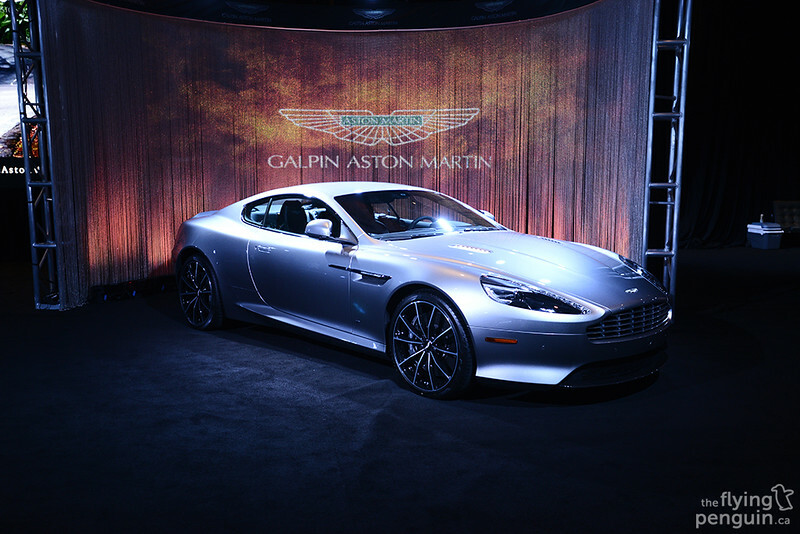 Aston’s still got it. 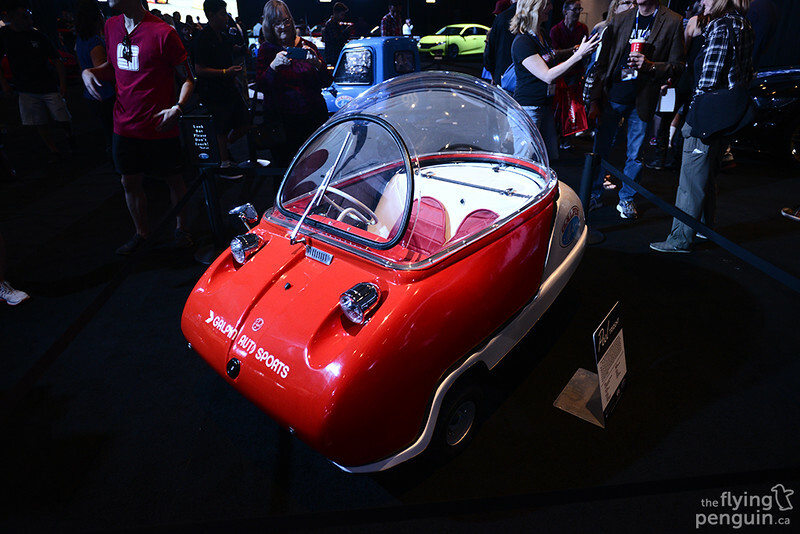 What is this tiny little bubble car you may ask? 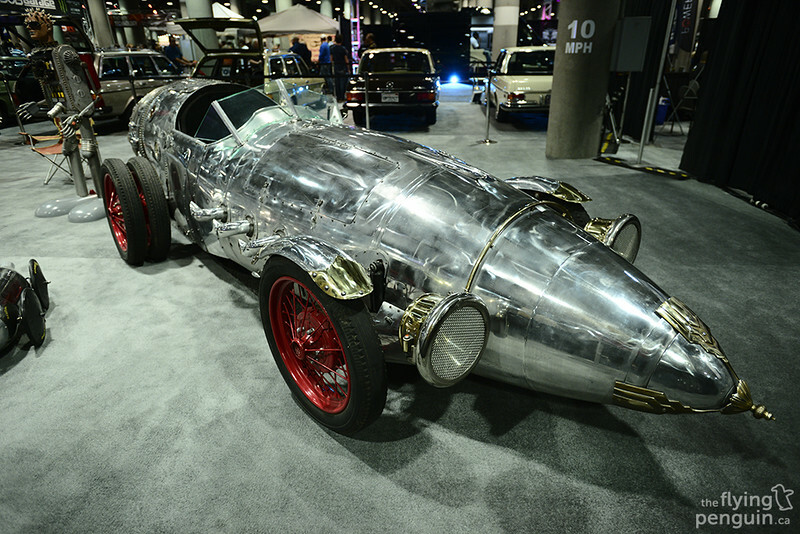 Why it’s the Peel Trident of course. 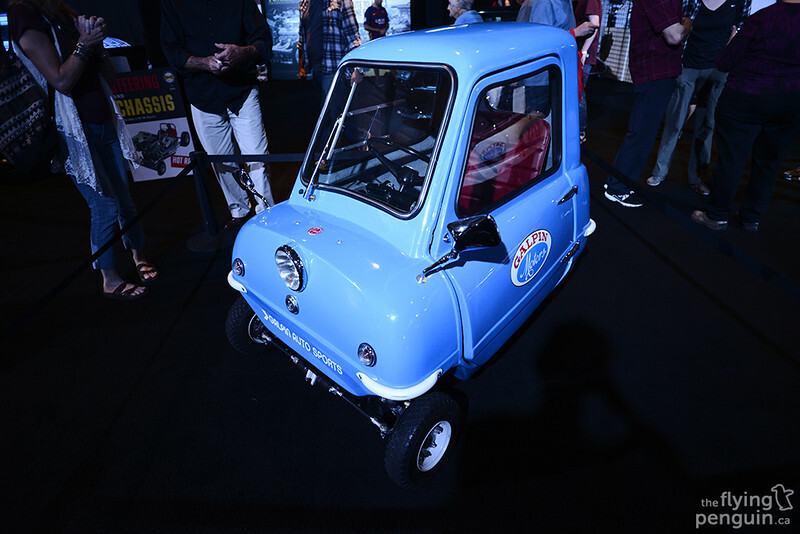 Right next to it was yet another one of my favourites from the show, the Peel P50 which despite its size, even Jeremy Clarkson can fit in! 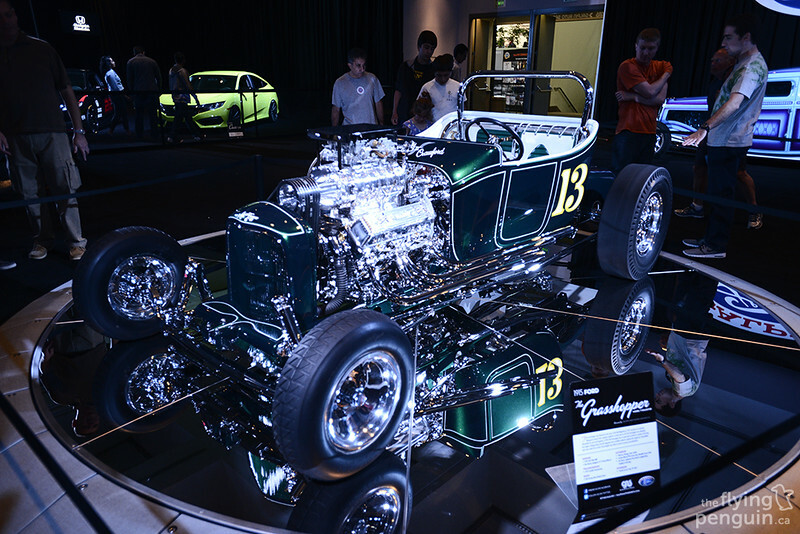 A 1915 Ford nicknamed “The Grasshopper” being shown off in all its shiny chrome glory. 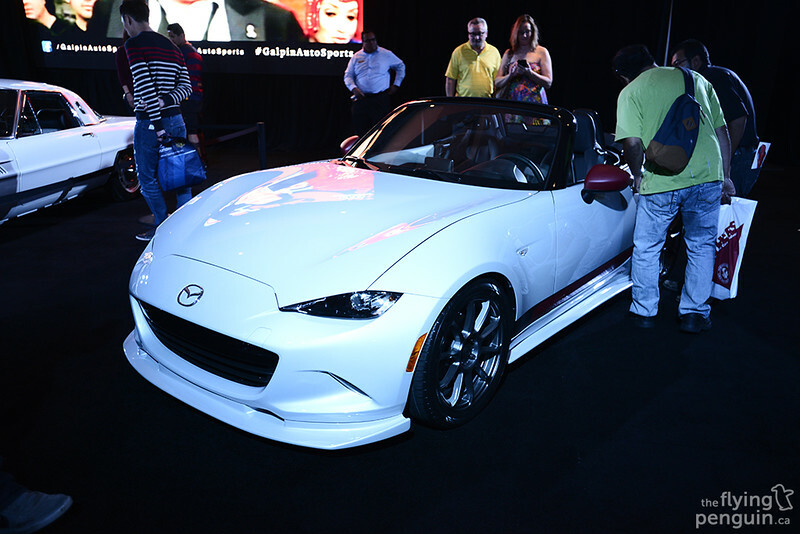 Galpin Auto Sports brought out a lightly modified version of the new MX-5 Miata which I think looks fantastic. 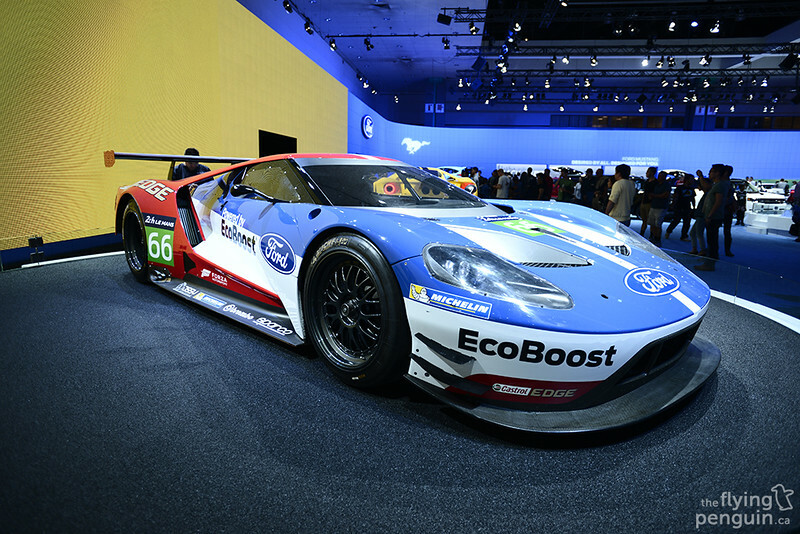 Only time will tell what else tuners will do to this new platform, but looks like they’re off to a good start! 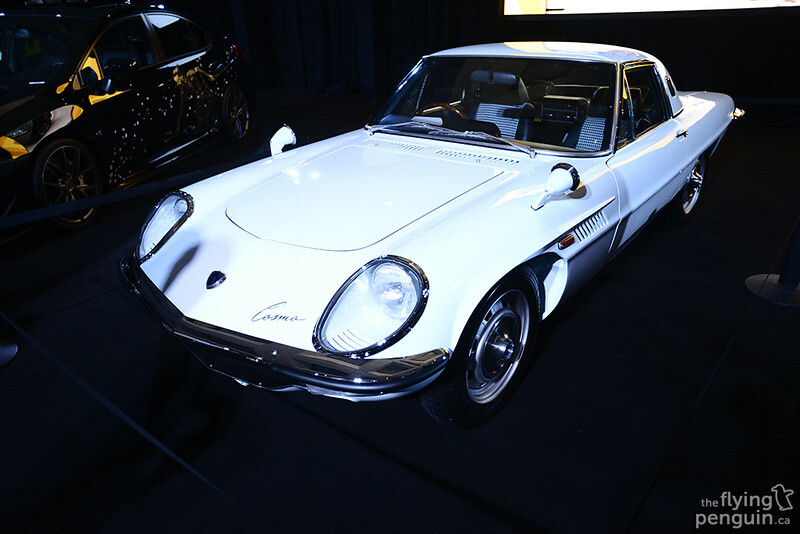 I was quite surprised to see a Mazda Cosmo at the show. 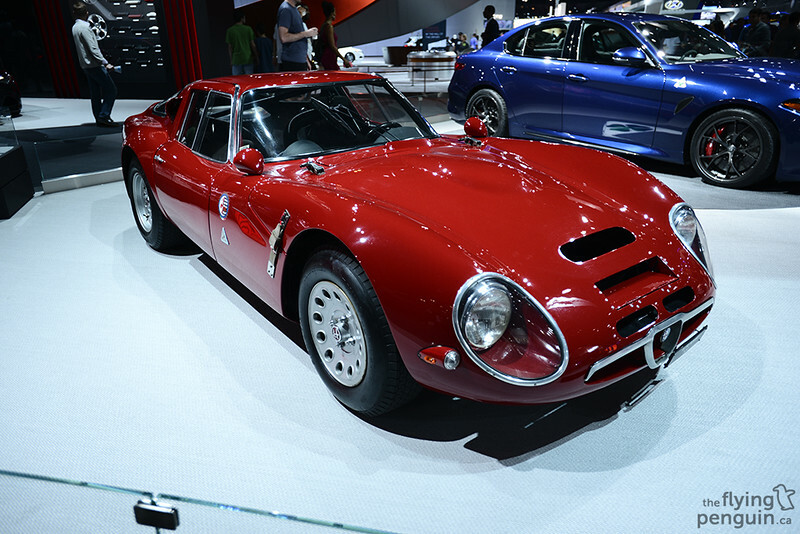 For those of you that don’t know, this was the very first vehicle to ever be equipped with the Wankel Rotary engine. Really digging the samurai livery on this WRX. 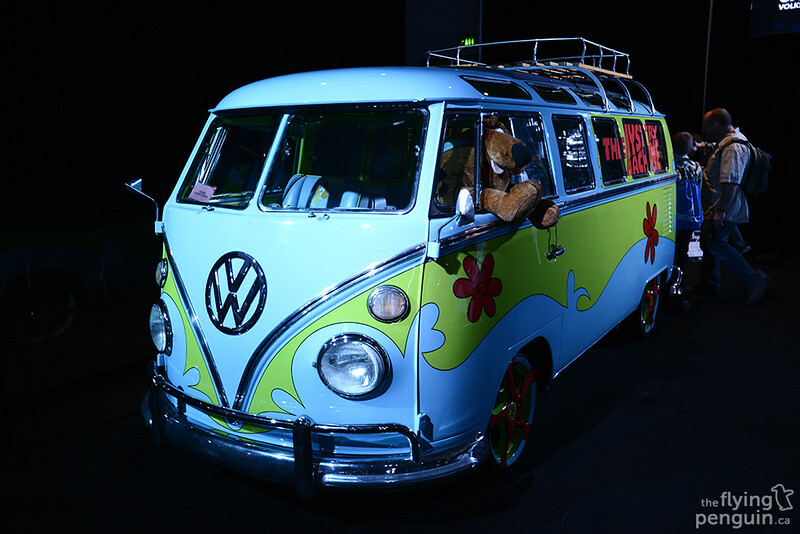 I really can’t think of a more perfect vehicle to use The Mystery Machine theme on. 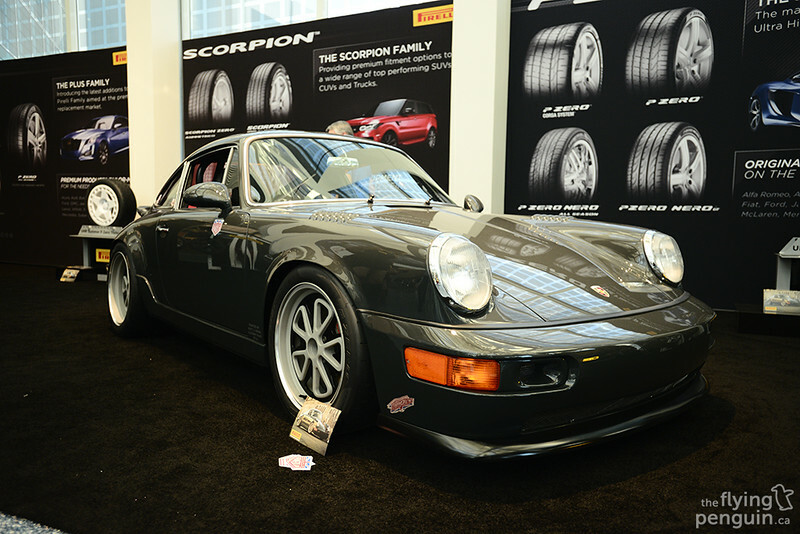 A very clean Magnus Walker built 964 over in the Pirelli booth. 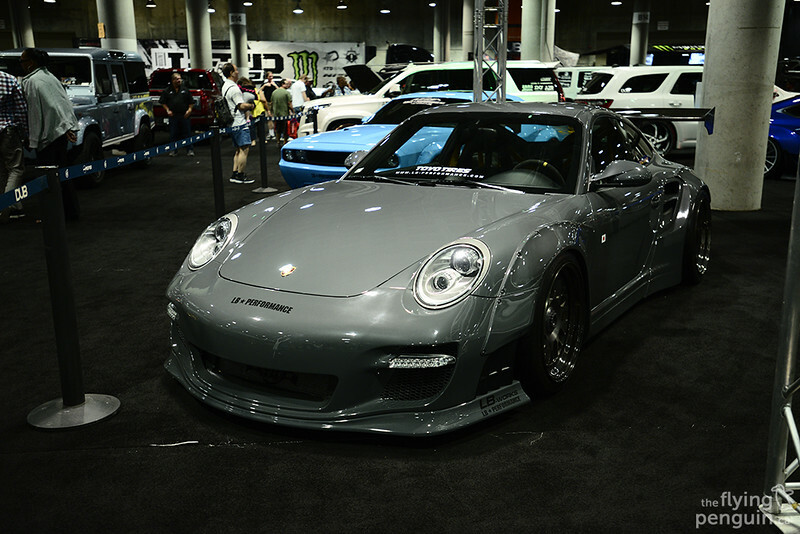 Porsche probably had the most baller “booth” of the show. 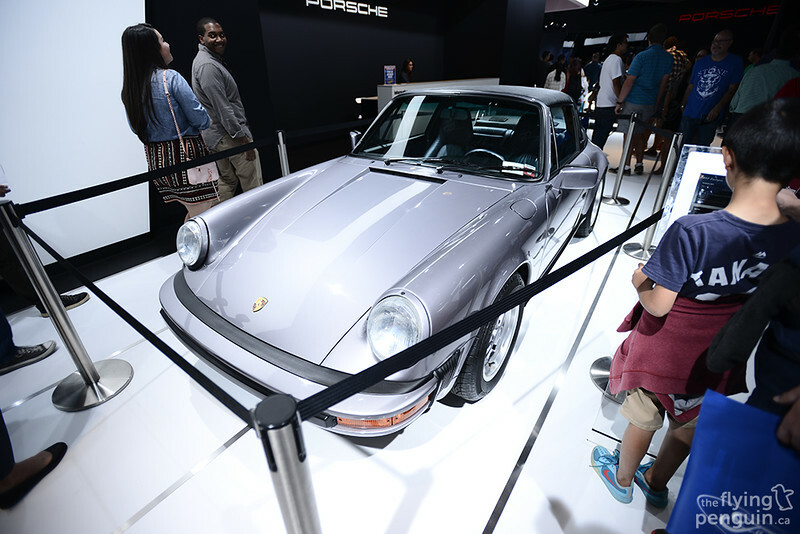 I use the quotations because it was actually an entire room that they had all to themselves, a perfect place to display some gorgeous machinery such as this 1988 Carrera Targa Commemorative Special Edition. 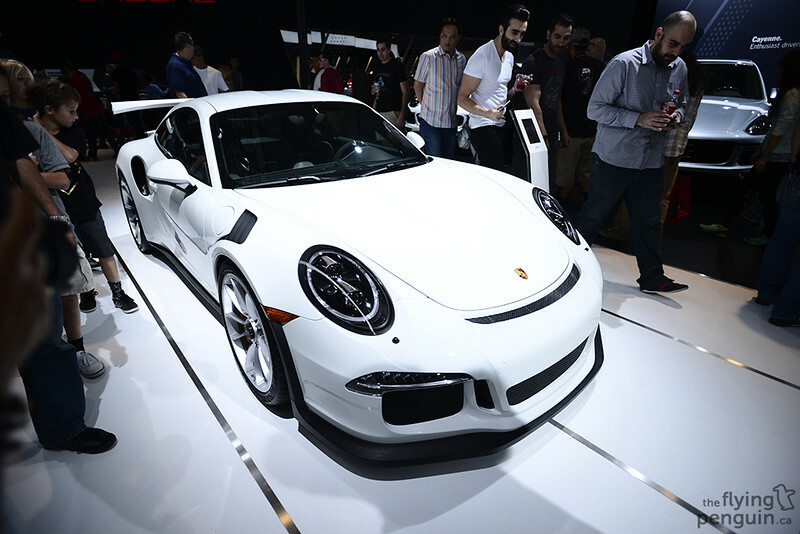 Or maybe you fancy something with a little more oomph, then how about the 991 911 GT3 RS? In case you’re wondering, yes that is still very much a Porsche. 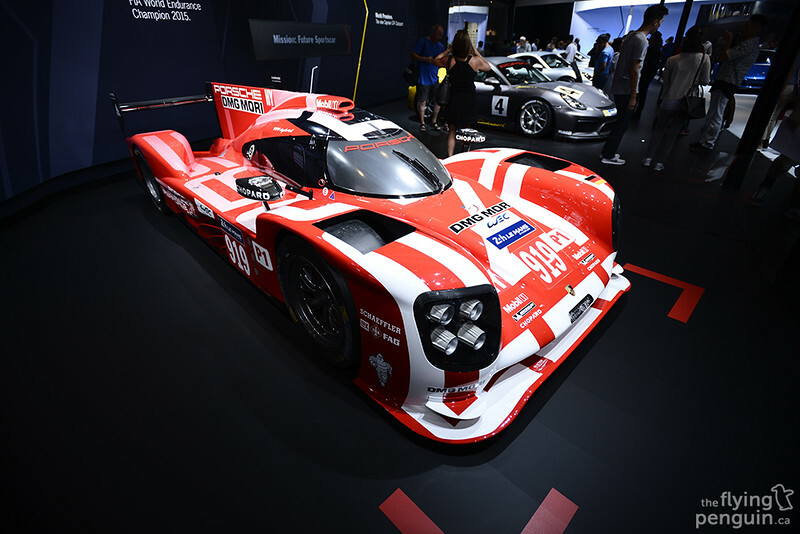 In fact it is the 919 Hybrid which won the FIA World Endurance Championship earlier this year! 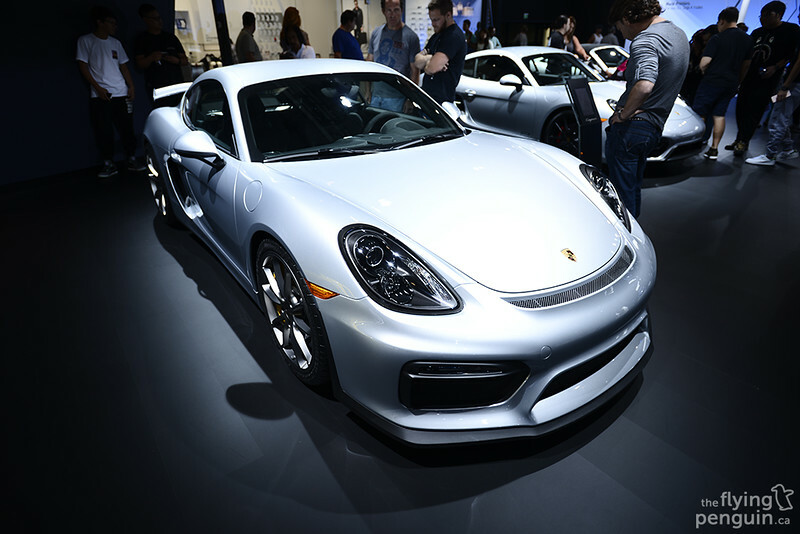 I think Porsche has done a fantastic job over the years improving the Caymans looks. 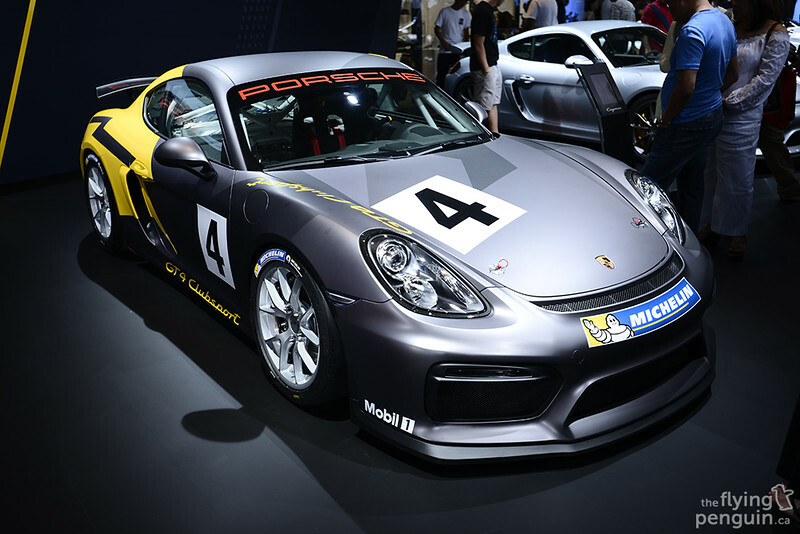 It was unbelievably difficult trying to take a picture of the Cayman GT4 Clubsport with no one standing in front of it. 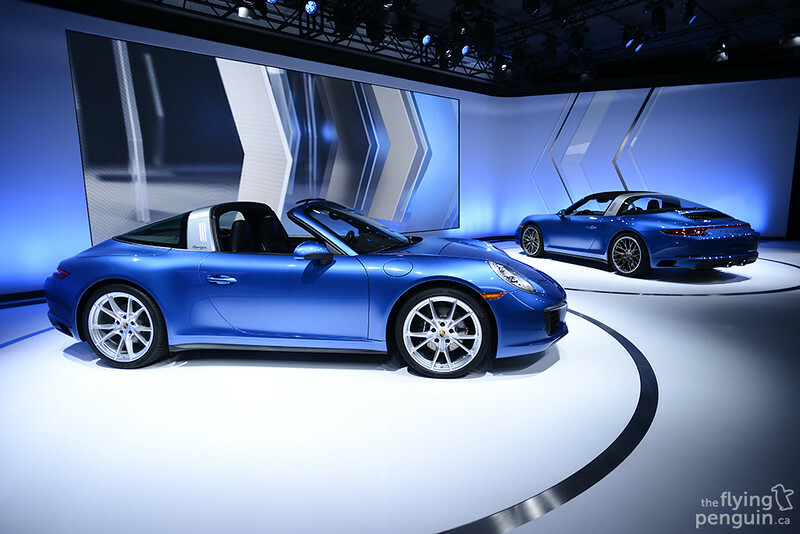 The new 911 Targa has one of the coolest roof retracting systems I’ve ever seen (reminiscent of the old Honda Del Sol electric roof). Sadly they didn’t have it in action when I was there. 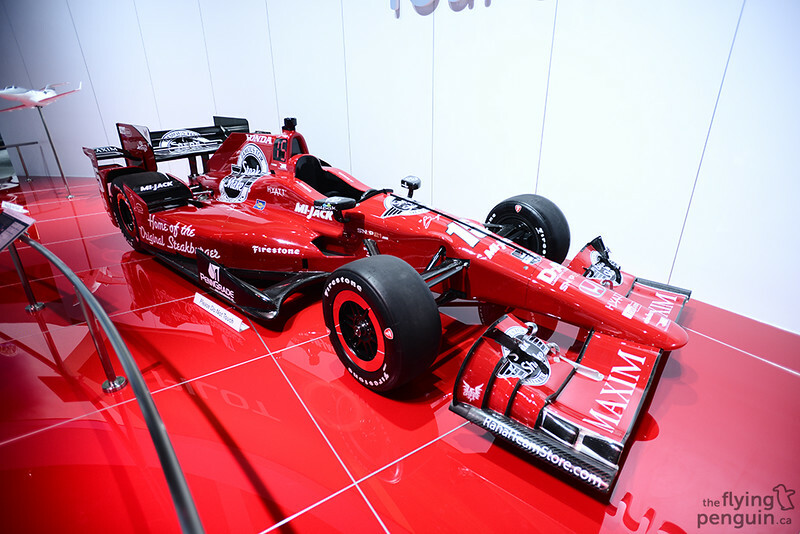 In addition to their entire fleet of vehicles, Honda also brought out a few gems for people to gaze upon, such as the 2025 Rahal Dallara IndyCar. 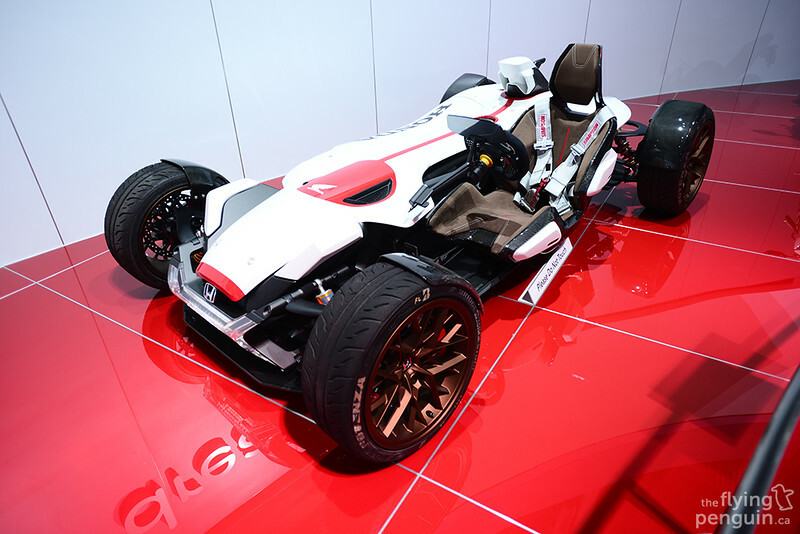 The Project 2&4 was probably one of the most original looking vehicles in the show. 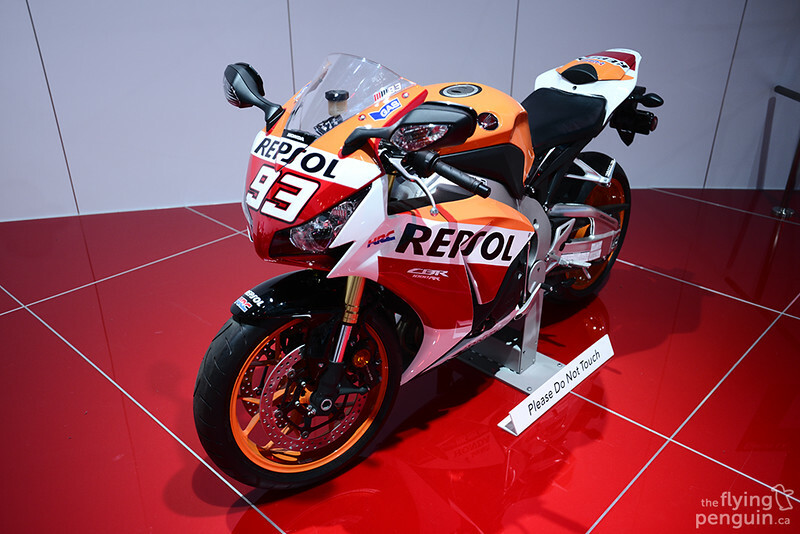 I’ve always had a soft spot for Repsol themed CBR’s. 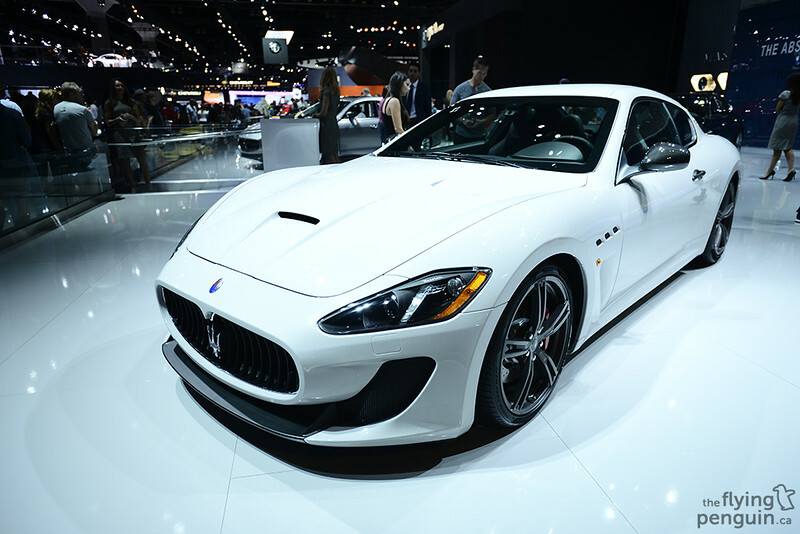 Just another thing to add to the wishlist. 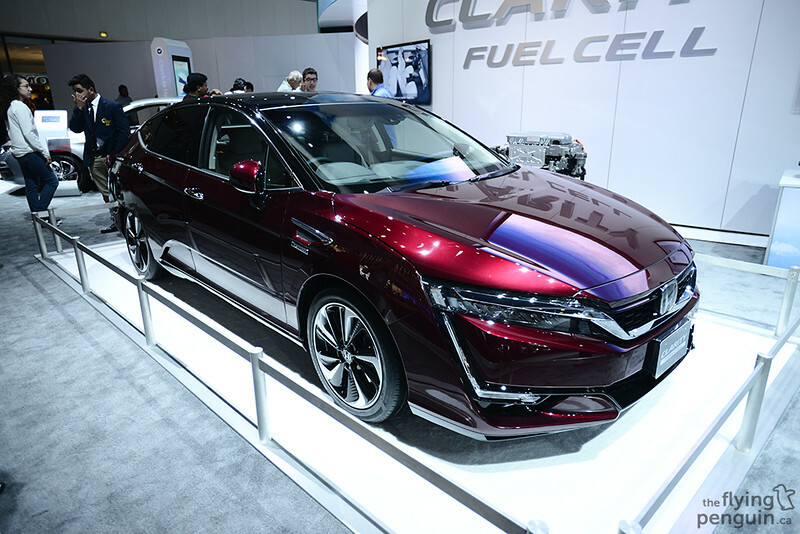 Another vehicle that I thought was really neat to be able to see in person was the Honda FCX Clarity. 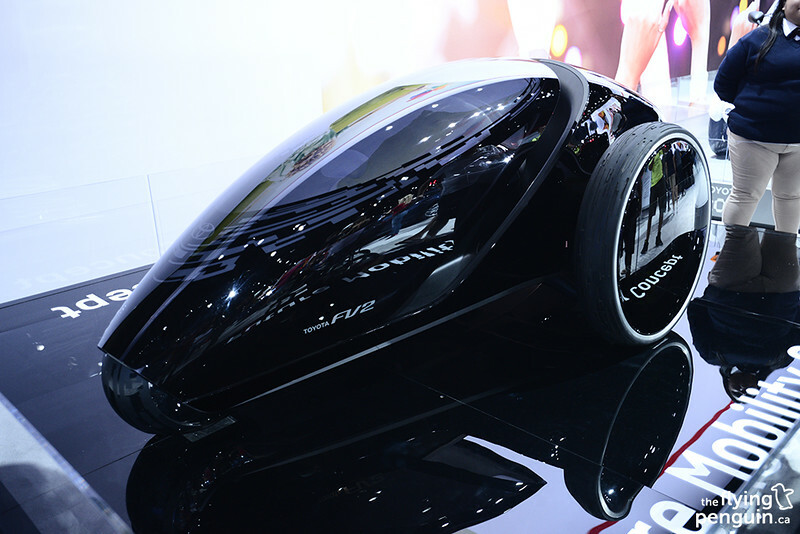 This vehicle uses a hybrid system featuring electric motors and a hydrogen fuel cell for power. 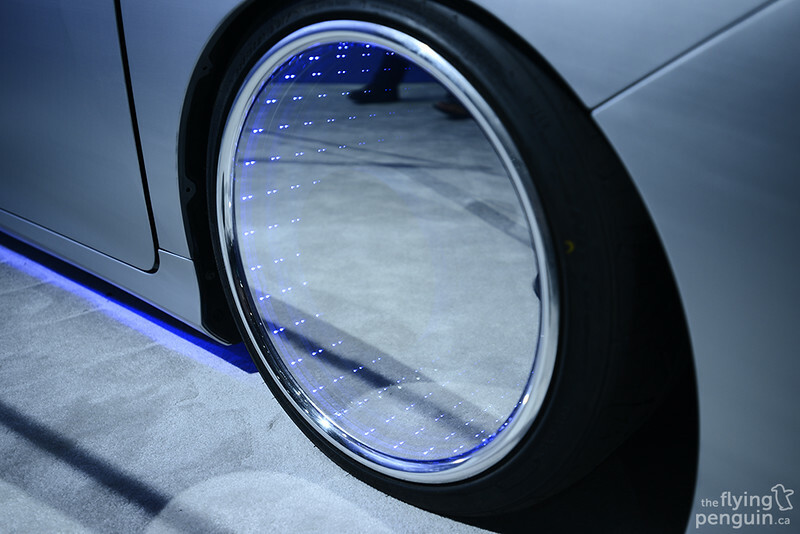 The last thing I heard about it however was that no one has been able to figure out a way to efficiently store hydrogen for use in an automobile yet. 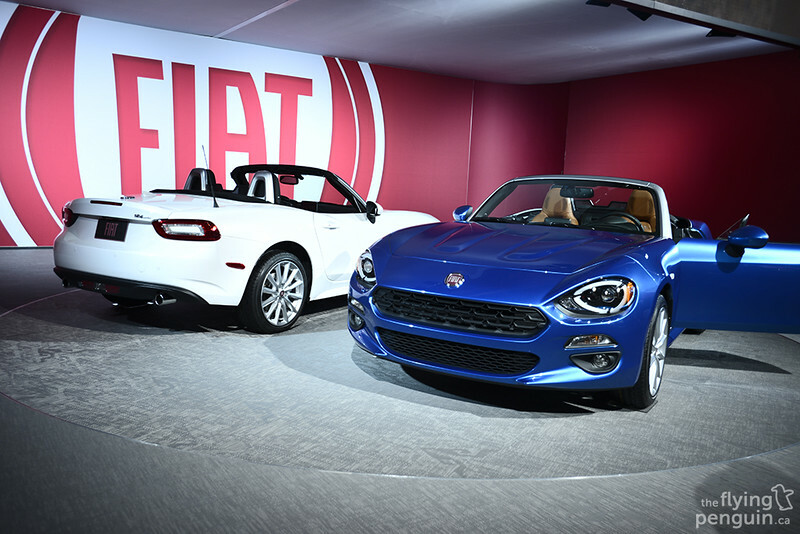 The front end of the new Fiat 124 Spider reminds me a lot of the original Datsun 240Z. 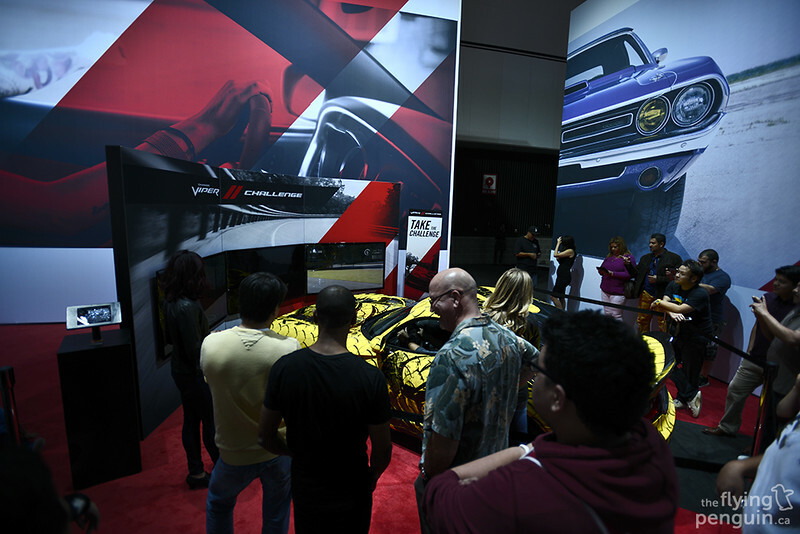 Dodge has a full racing simulator built right into a Viper for people to try! I don’t even know what this is buy I think it looks awesome. 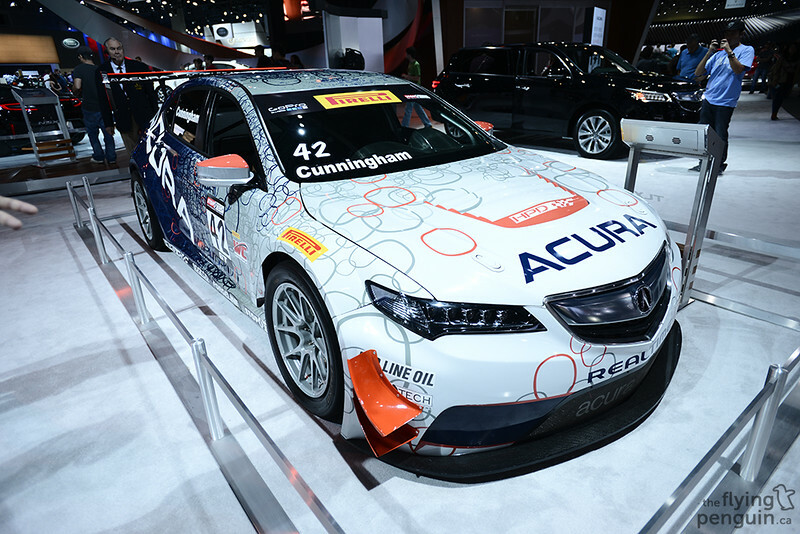 …with the racecar version sitting right next to it! Downstairs in the convention hall was the aftermarket section, so you know I wouldn’t be able to stay away from there for too long. 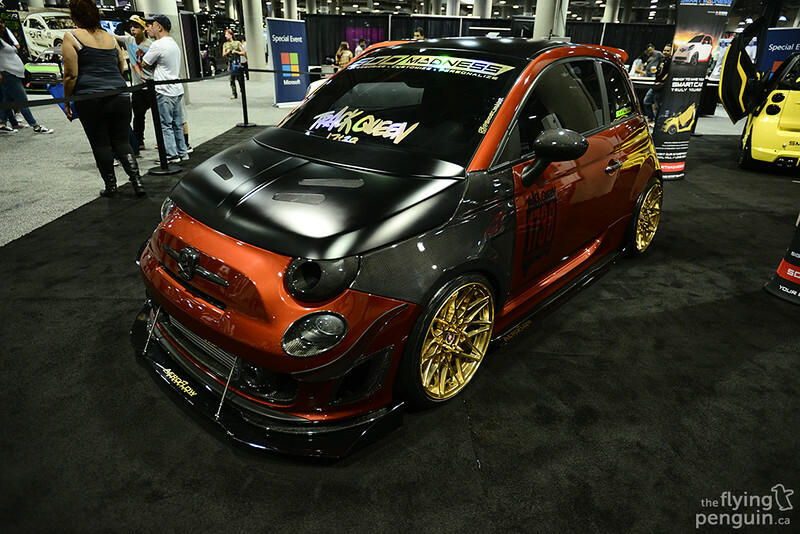 Quite a serious looking Fiat 500. 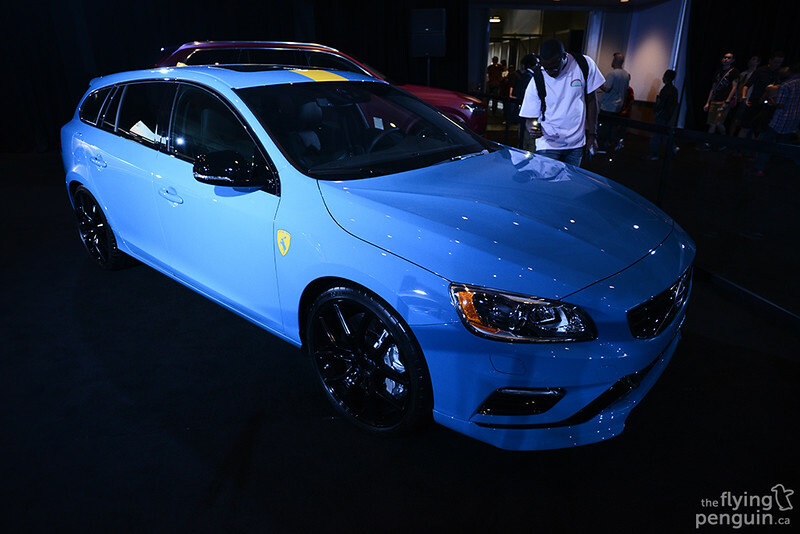 It would appear that underglow is slowly making a comeback. 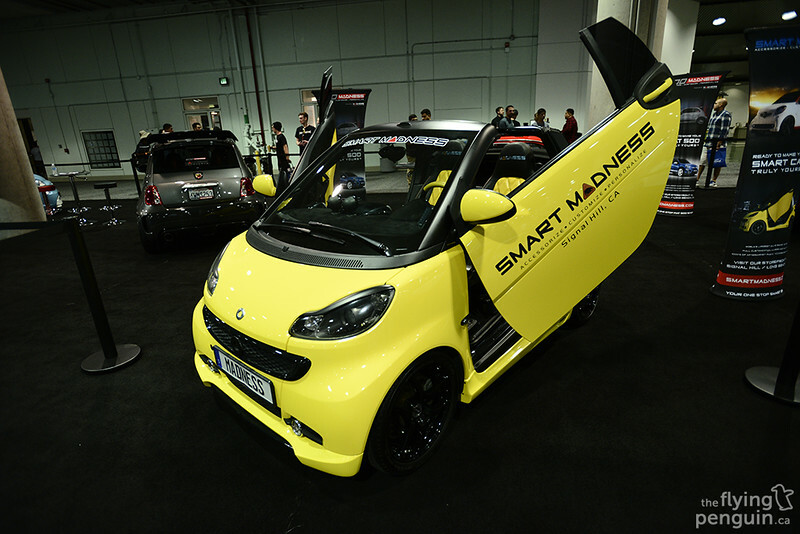 I wonder if Lambo doors are next? 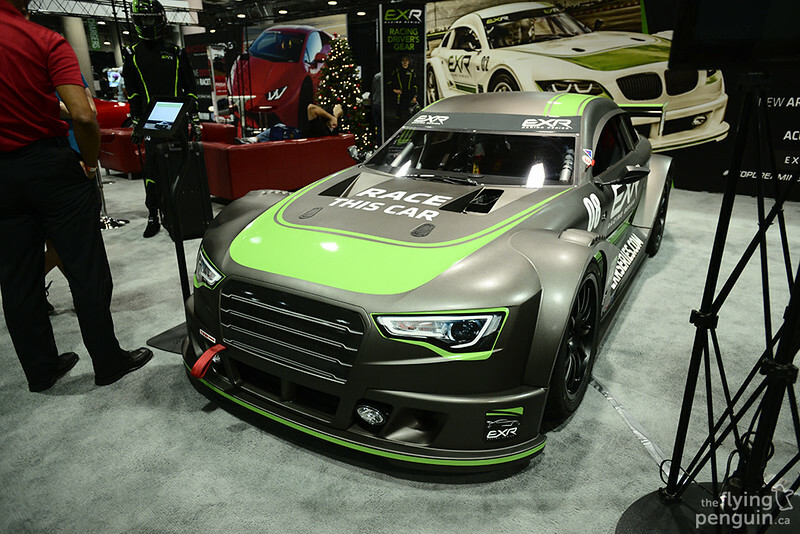 EXR Racing Series brought out one of the many race-ready vehicles that you can rent and race on a track. 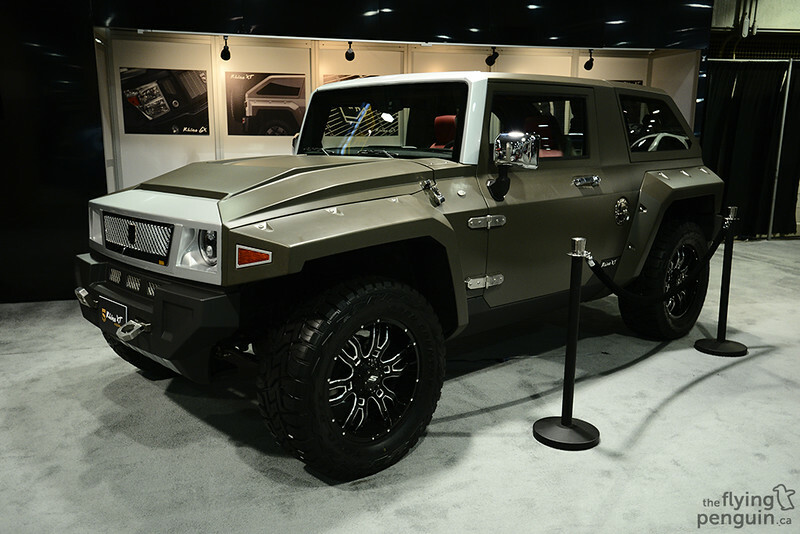 This enormous tank looking thing is actually a USSV Rhino XT. Sculptor/artist Baron Margo had some interesting one-off creations on display. 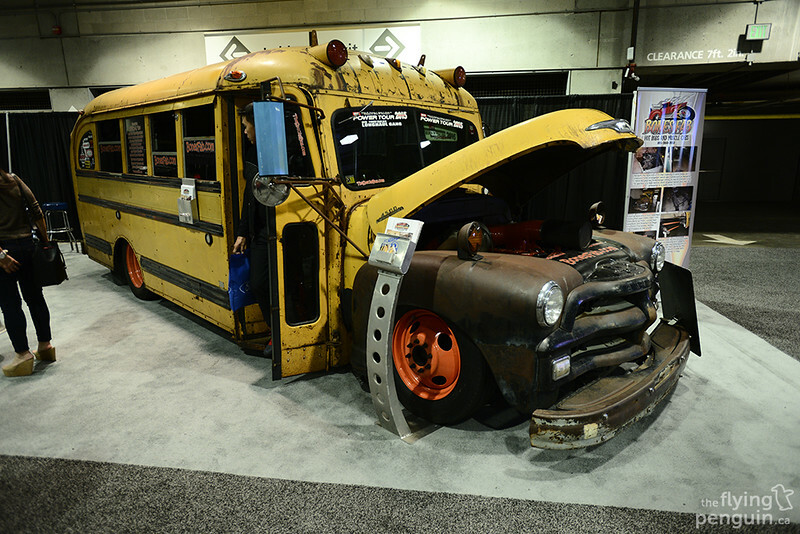 If all school buses were this cool I’d have no problem going back to school. 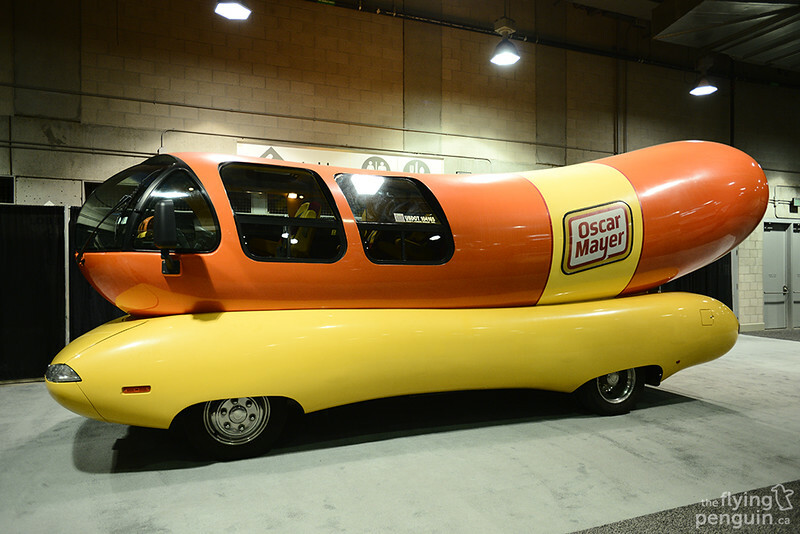 I remember when I was a kid the Oscar Mayer Weinermobile just happen to drive by a restaurant I was eating at. I instantly ran outside only to watch it drive away, but this time it wasn’t going anywhere! 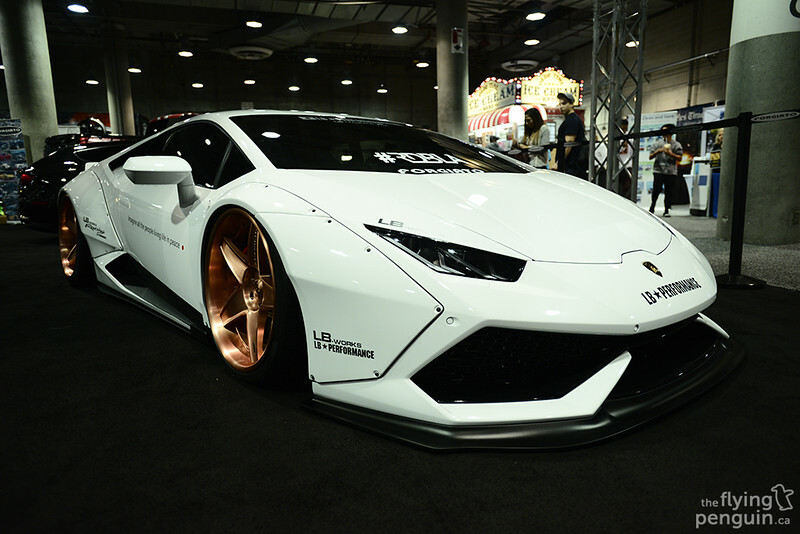 Liberty Walk seems to be taking the USA market seriously and had their own booth setup with many demo cars to drool over. I know I know, when is the “over-fender craze” ever going to stop. 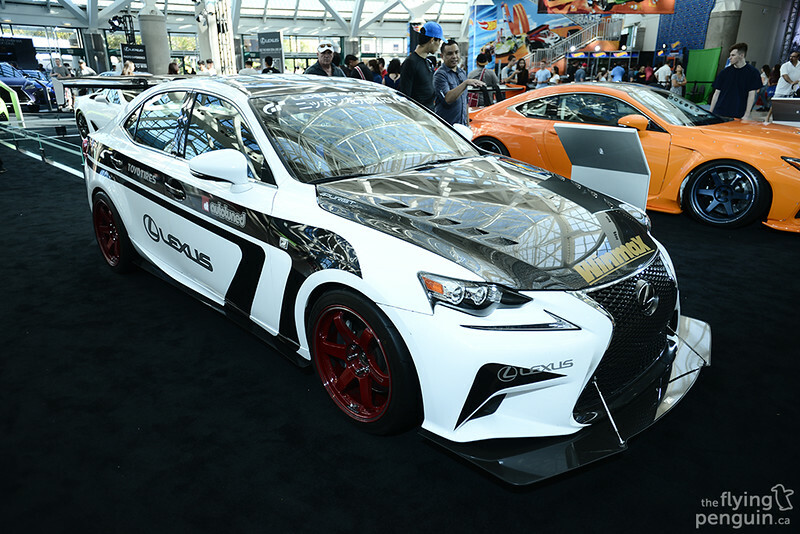 Maybe it’s just because I don’t see a lot of Liberty Walk or Rocket Bunny kitted cars in person, but I really didn’t mind seeing all of these amazing machines in one place. 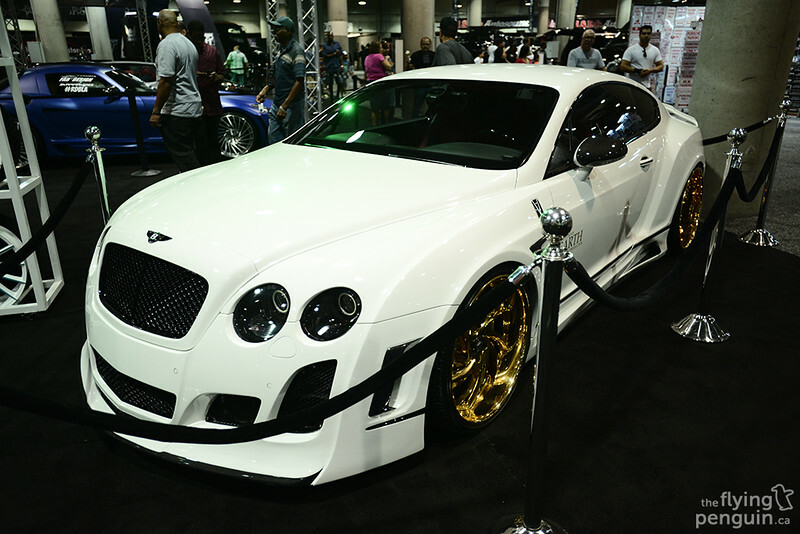 Not sure how I feel about this Bentley, but this is certainly something you don’t see every day. Despite the flashy look, I actually don’t really mind this Panamera. 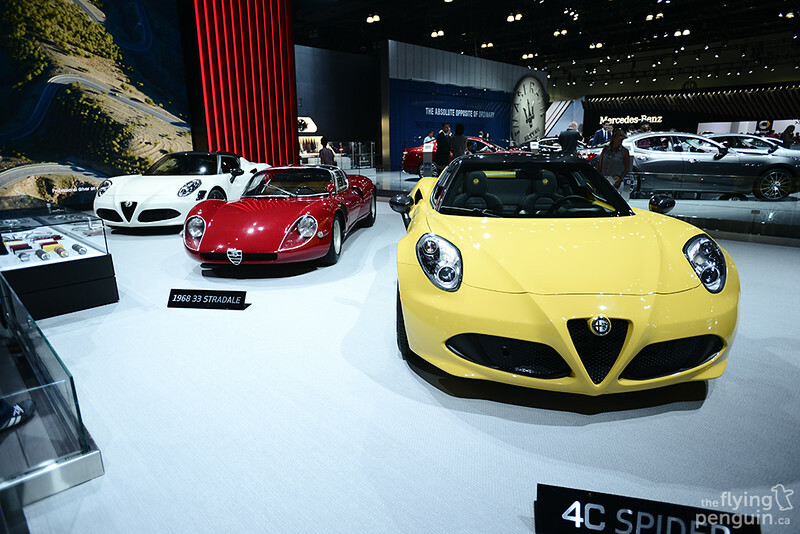 In fact there seems to be a particular trend with many of the vehicles at the show. 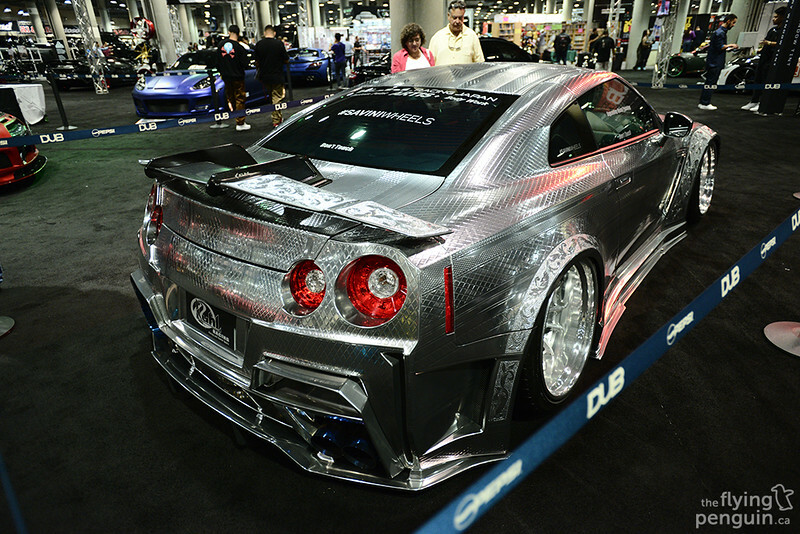 KUHL Racing brought out their infamous GTR and words really cannot describe the attention to detail on this car. 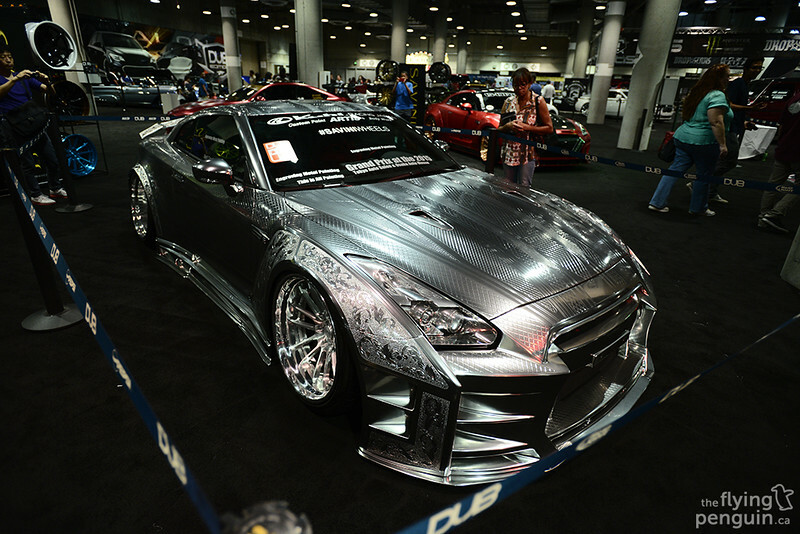 The paint is ARTIS 3D Ultimate Engraving Metal Paint and from what I know was all done by hand. Insane. 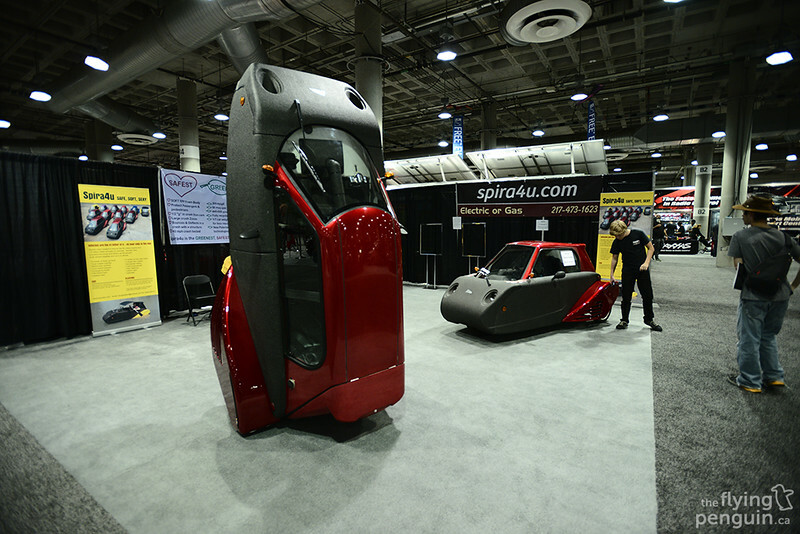 Looks like someone got a little inspiration from Top Gear here. 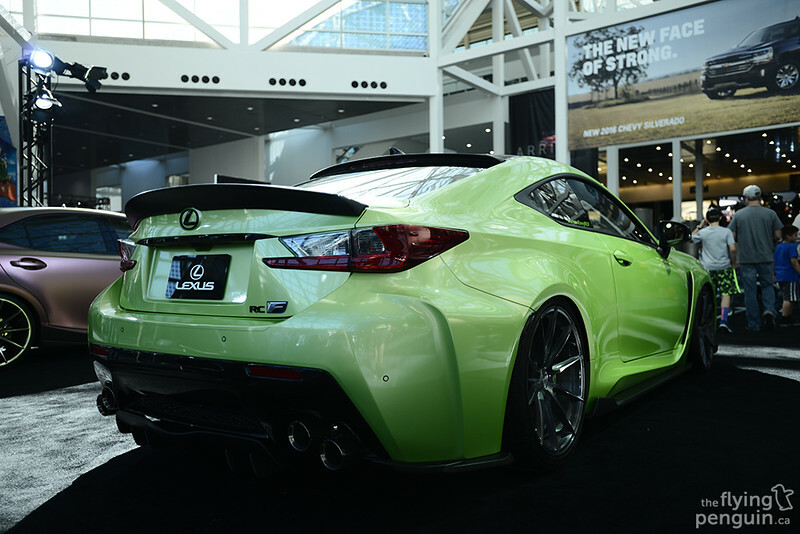 Hope you guys enjoyed my coverage from the LA Auto Show! It’s not too often I get to attend events like this so I definitely had a blast. 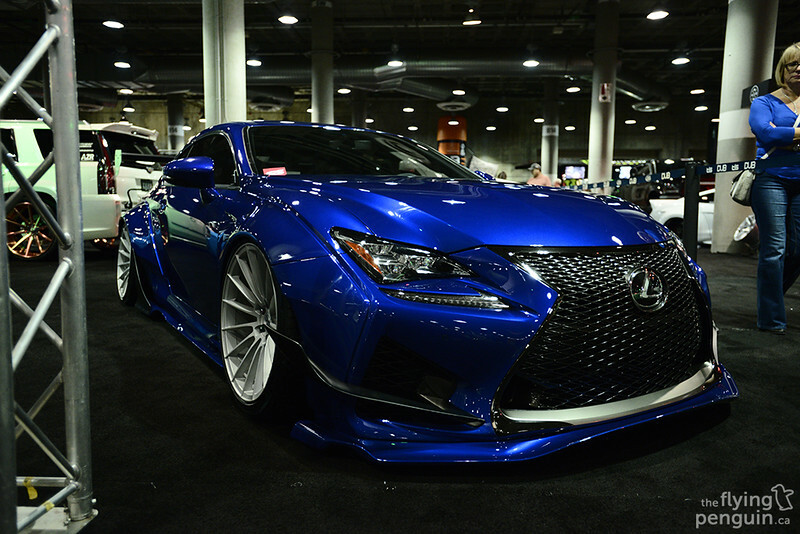 Make sure to check out the Flickr link below as well as there’s many more photos from the show in there.